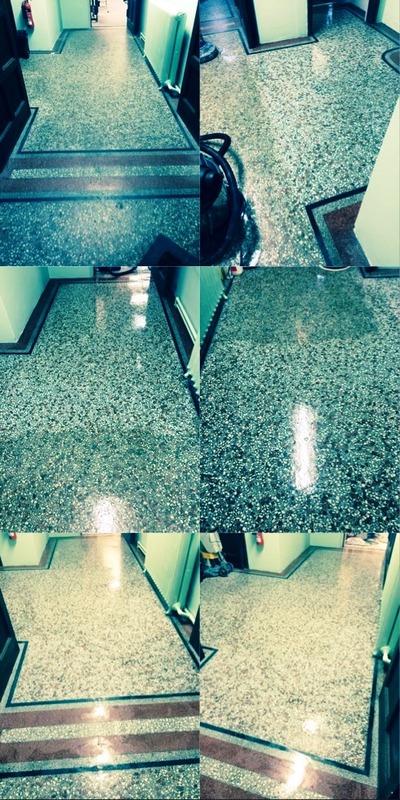 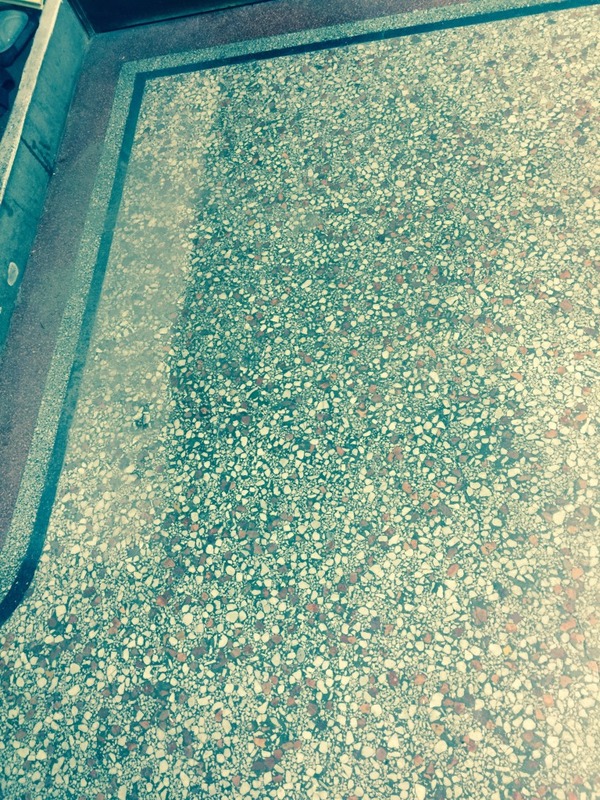 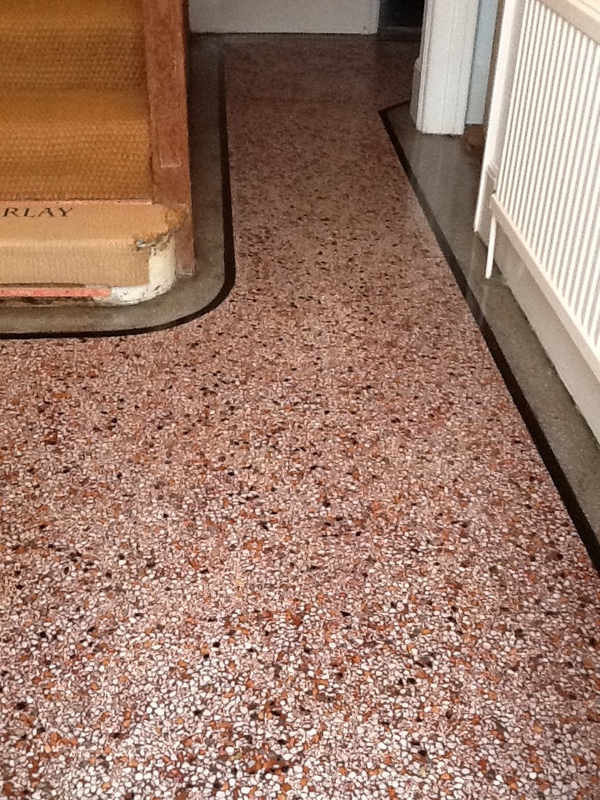 A few months ago I was called down to the coastal town of Southend to restore a damaged Terrazzo tiled floor. 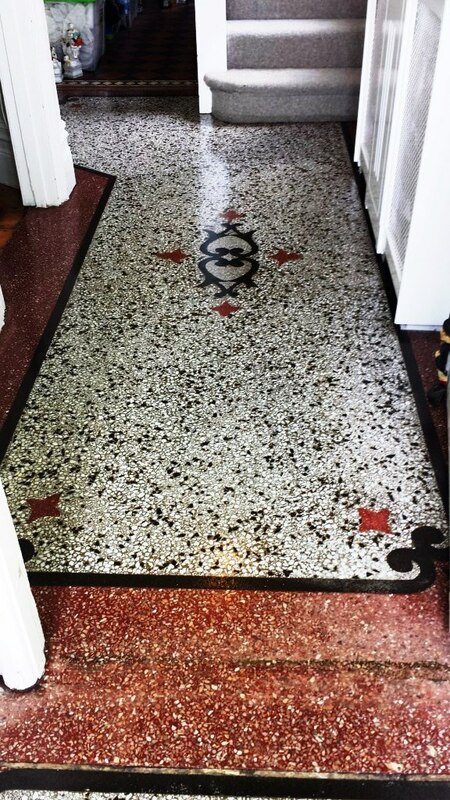 Terrazzo is a very beautiful type of stone of Italian origin, and has been used for hundreds of years for residential flooring. 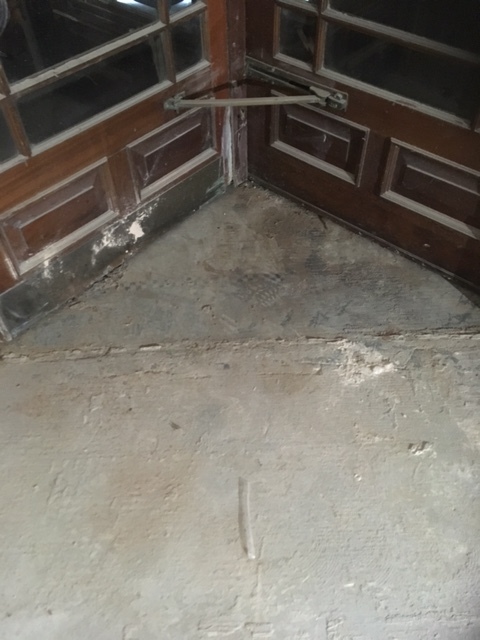 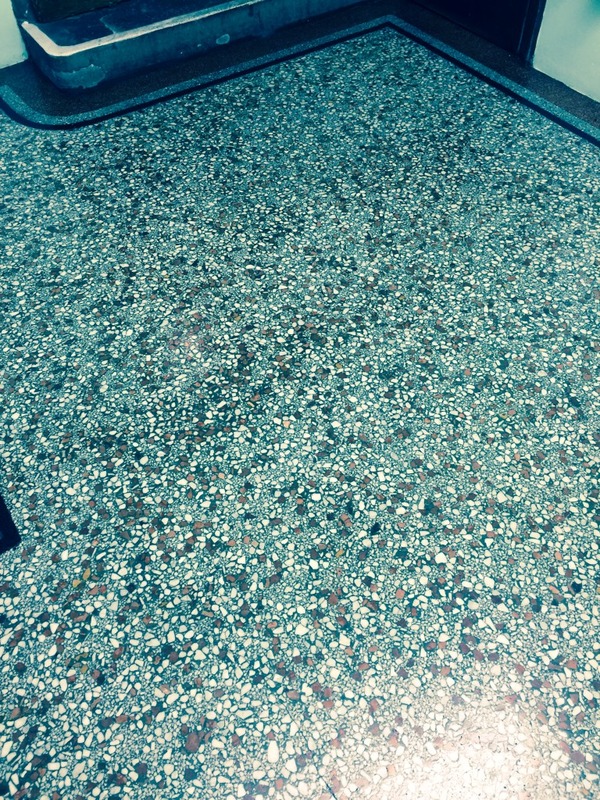 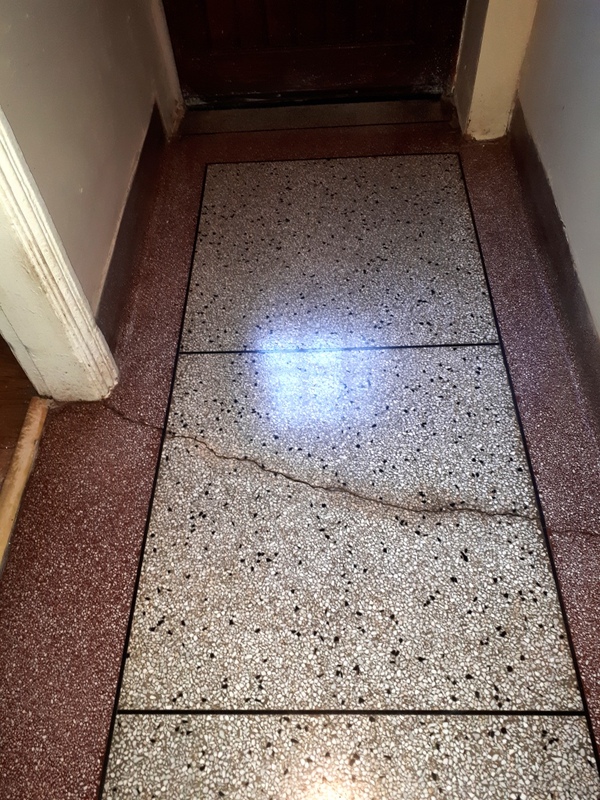 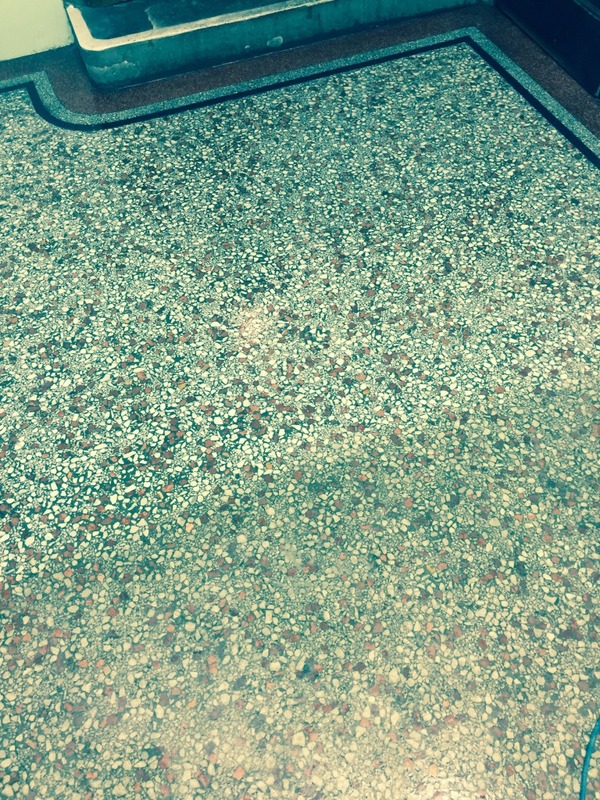 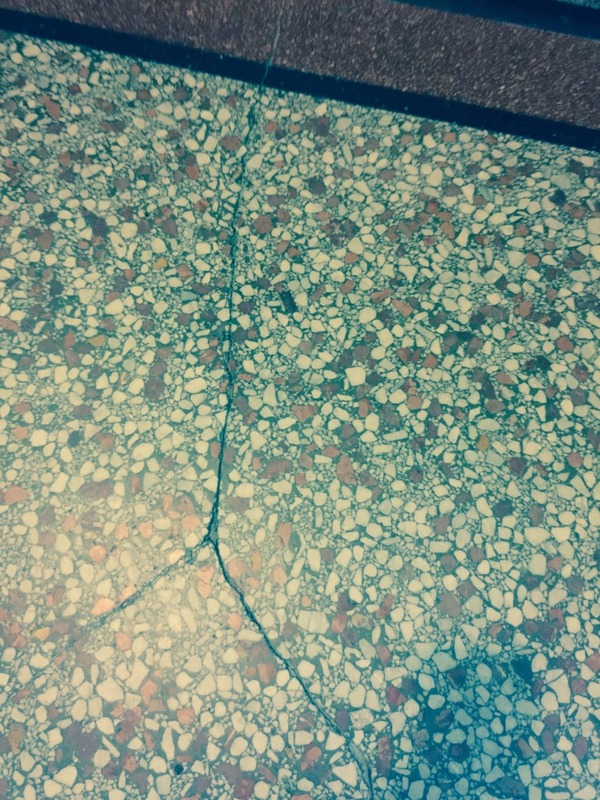 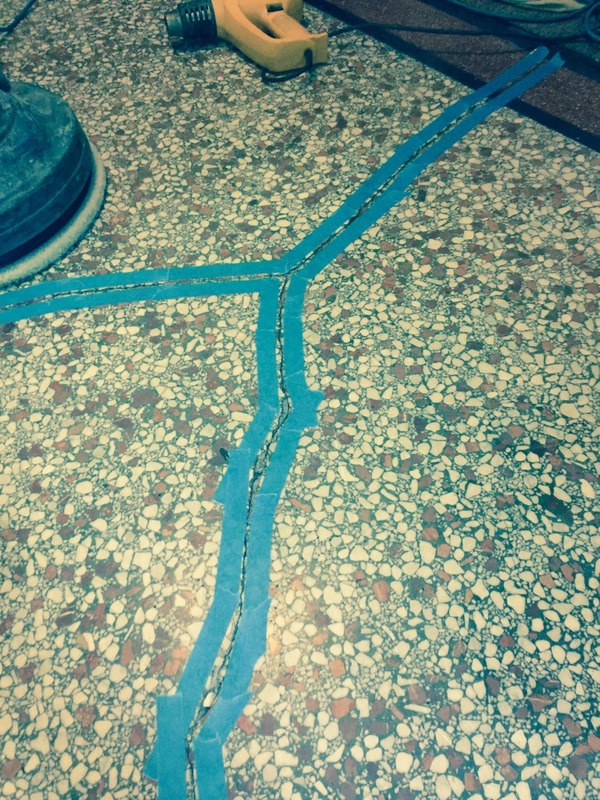 The problem with this floor was a significant crack in the surface that was not only spoiling the appearance of the Terrazzo, but also posed a potential hazard for anyone walking in and around this area. 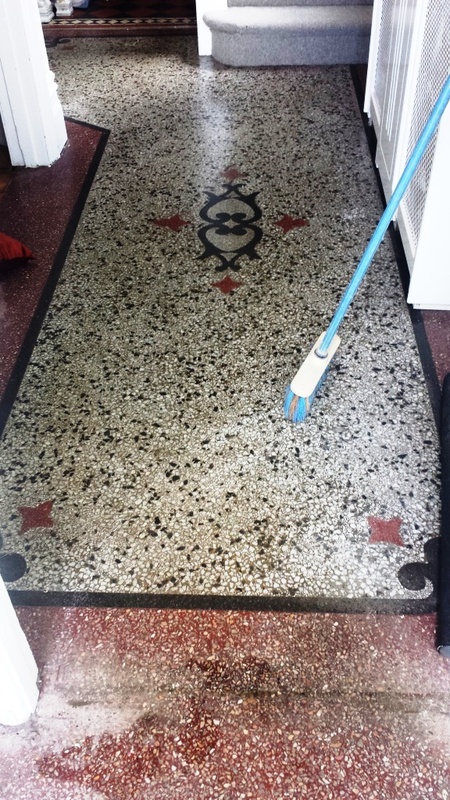 I was also commissioned to give the floor a thorough clean and seal . 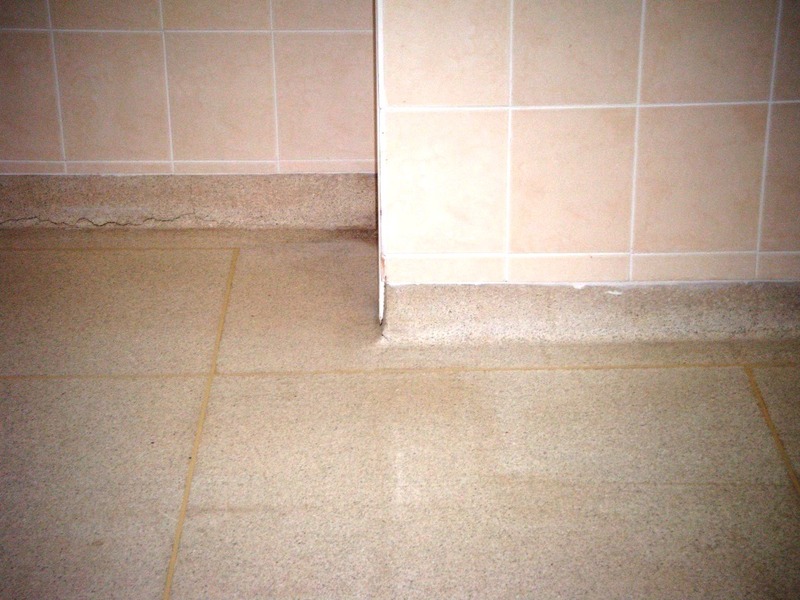 To begin the repair, I first mixed a strong solution of one part Tile Doctor Pro-Clean to three parts clean water. 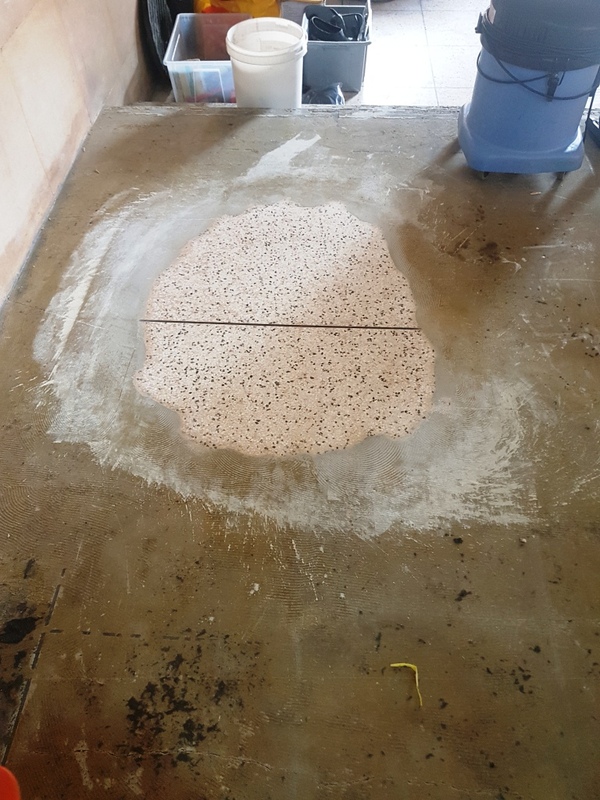 I then applied this solution to the hole and the surrounding area, making sure that any dirt and muck had been completely removed before filling. 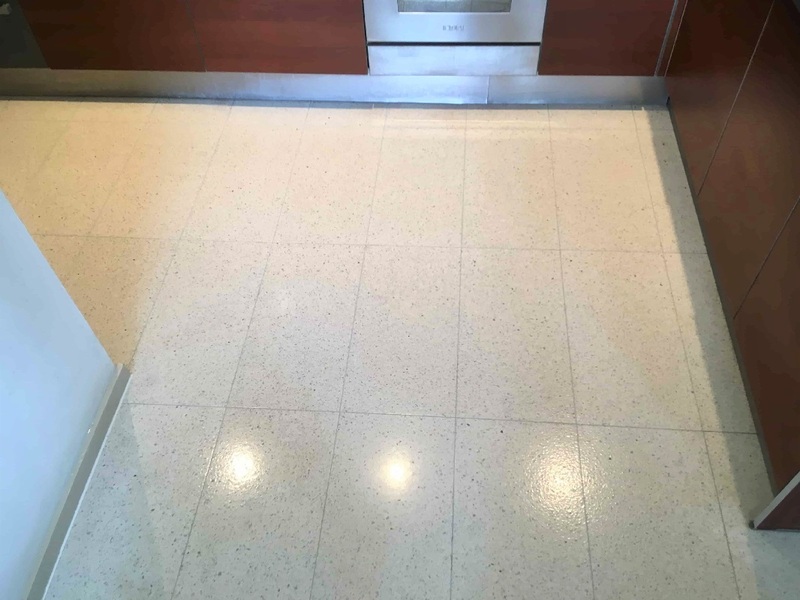 Pro-Clean is a versatile, alkaline cleaner recommended for cleaning natural stone floors. 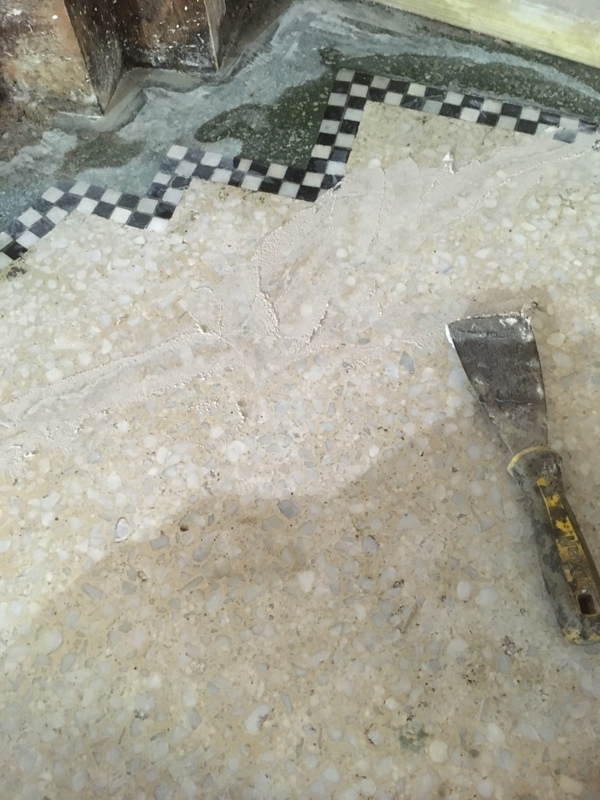 The damaged area was then dried using an air blower to remove any moisture from in and around the hole, paying special attention to the tricky cracks that were not so easy to dry. 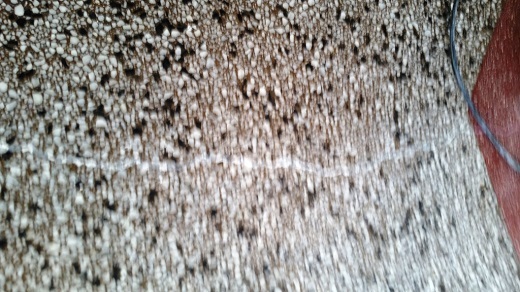 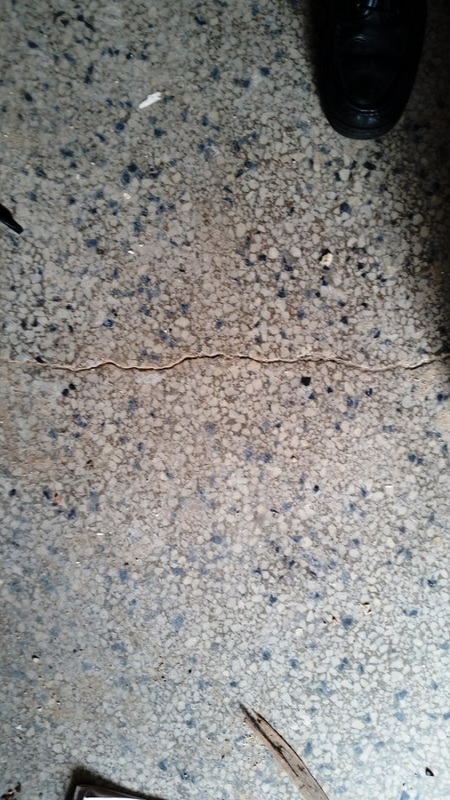 The cracks were then filled with a stone glue and hardener. 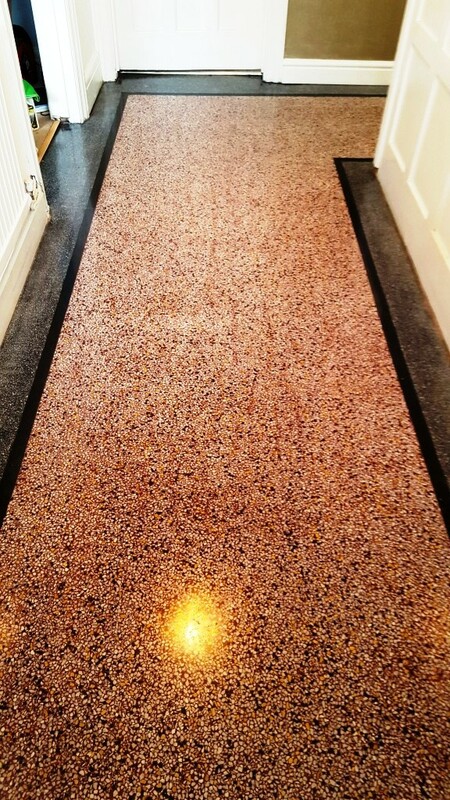 Once the filling had been completed I gave the area a coat of acrylic paint mixed with glue to match the original colour of the floor as much as possible. 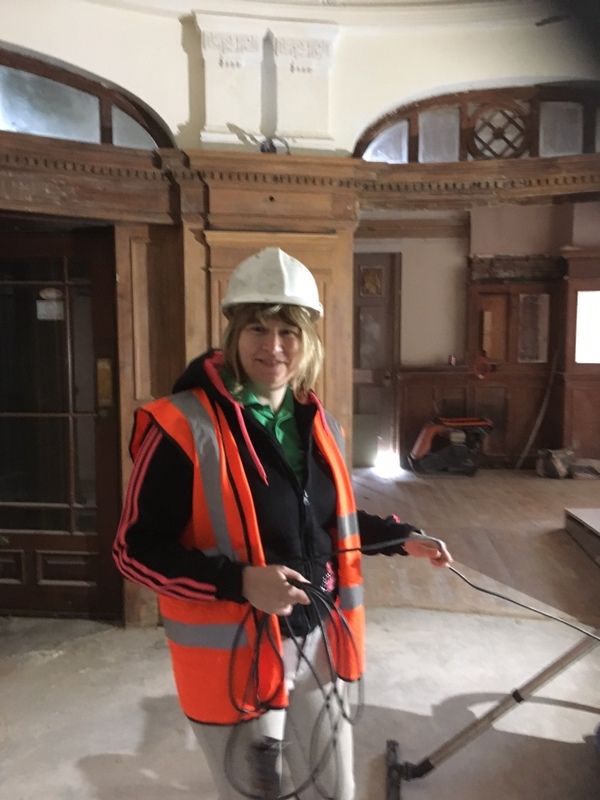 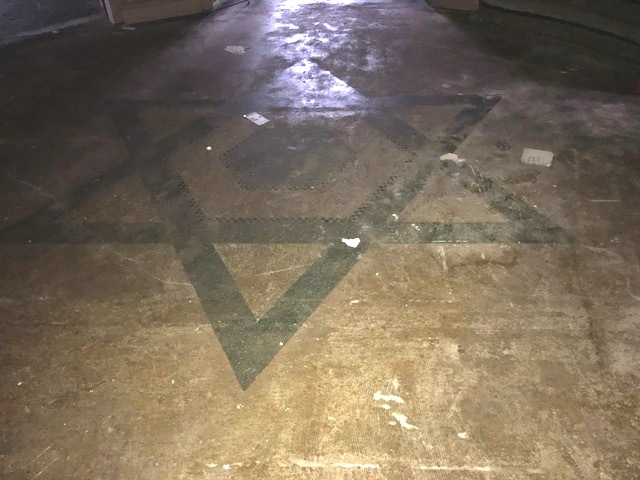 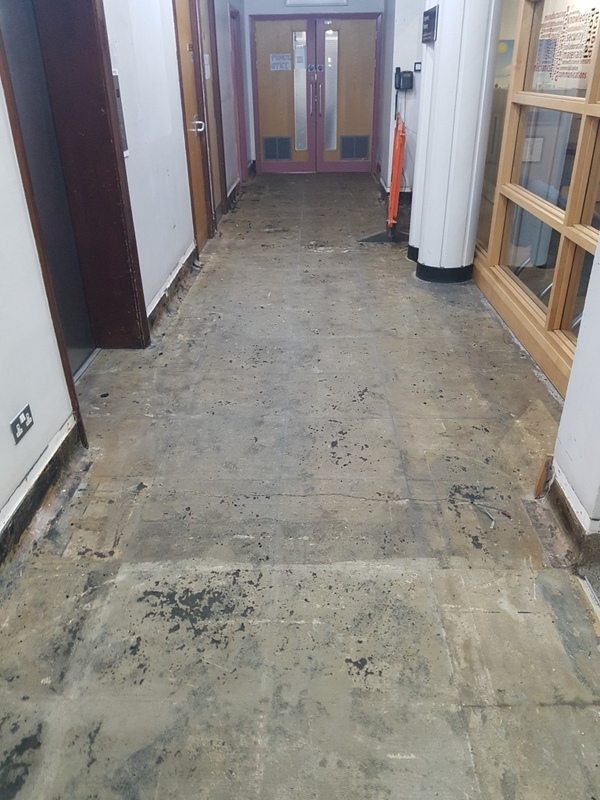 The final stage in the repair process was sanding down the treated area to achieve a smooth surface that was consistent with the rest of the floor. 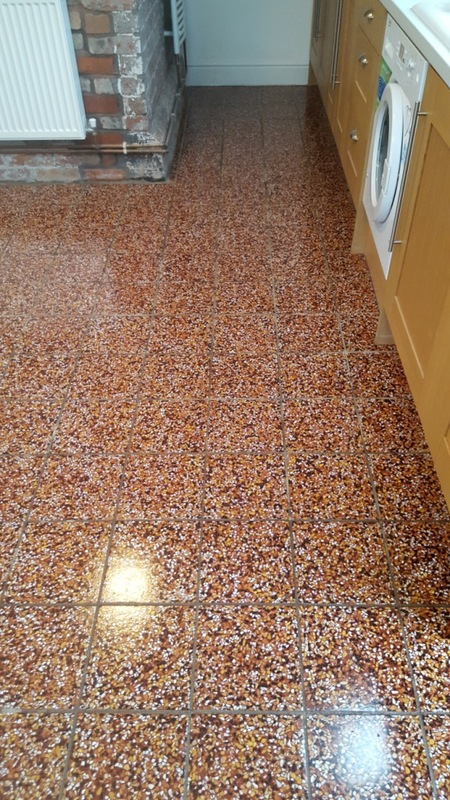 As you can see from the photograph, the finish came out very nicely however I apologise for the photograph which I appreciate could have been better. 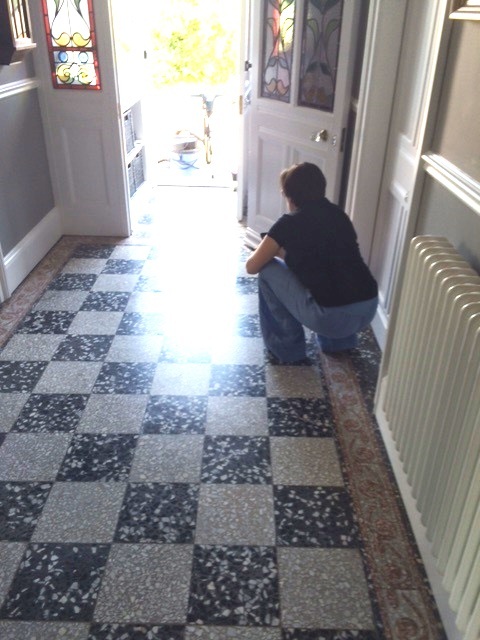 As aforementioned, I was also commissioned to give the floor a thorough clean. 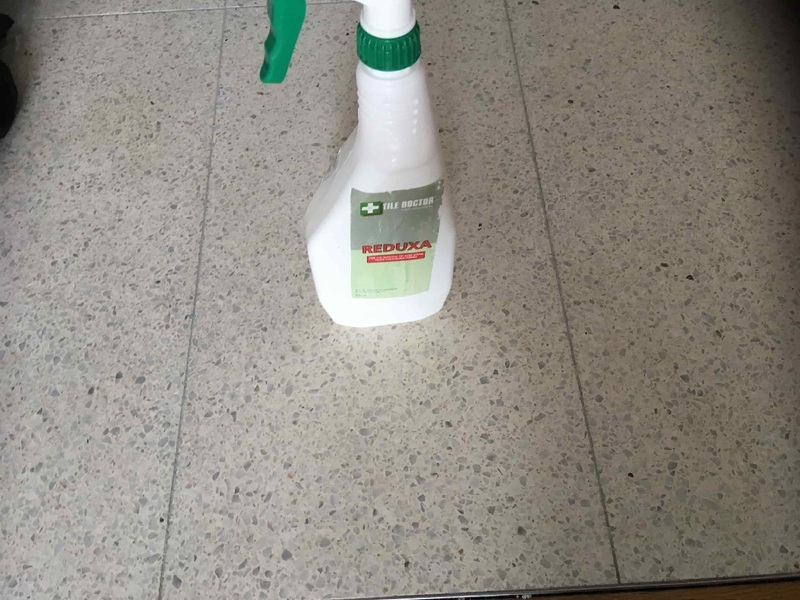 I did this using a similarly diluted solution of Pro-Clean and water. 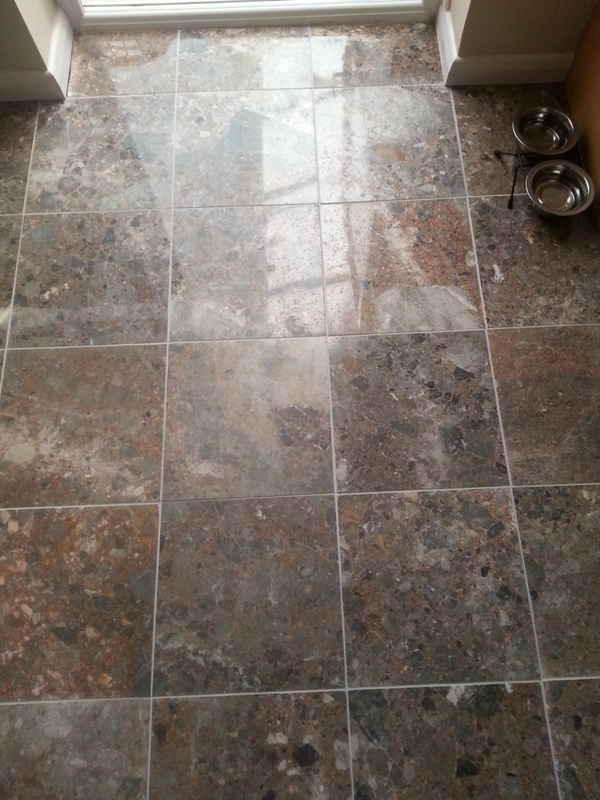 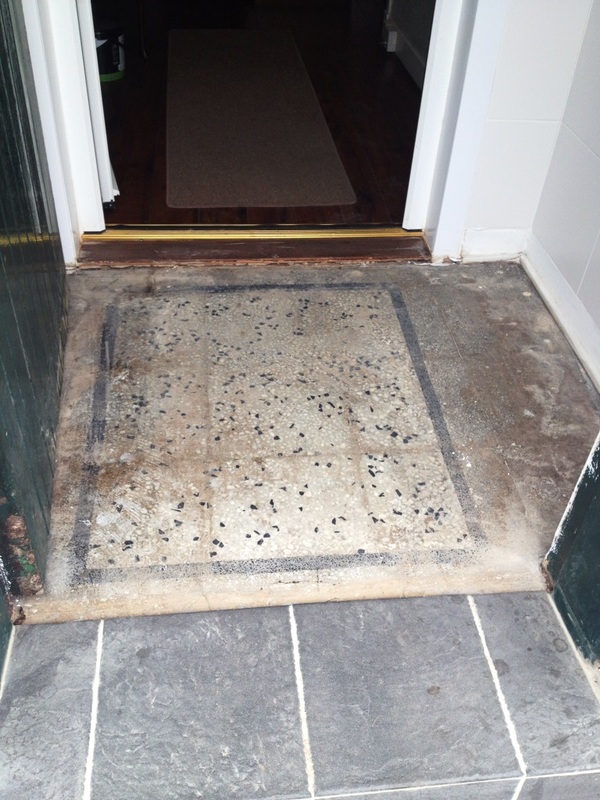 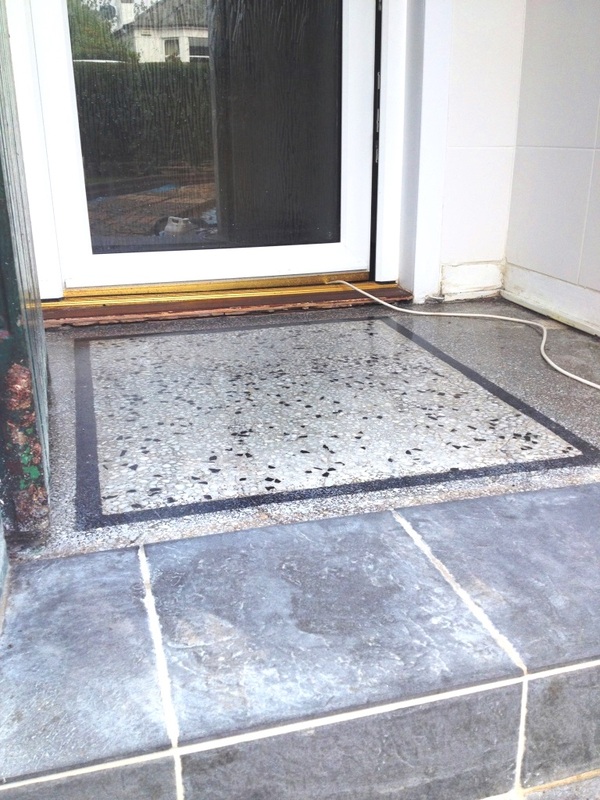 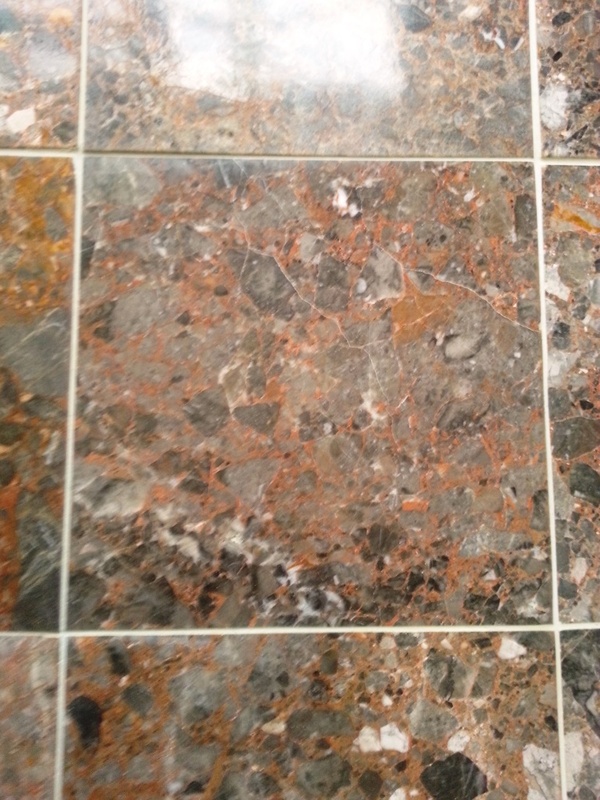 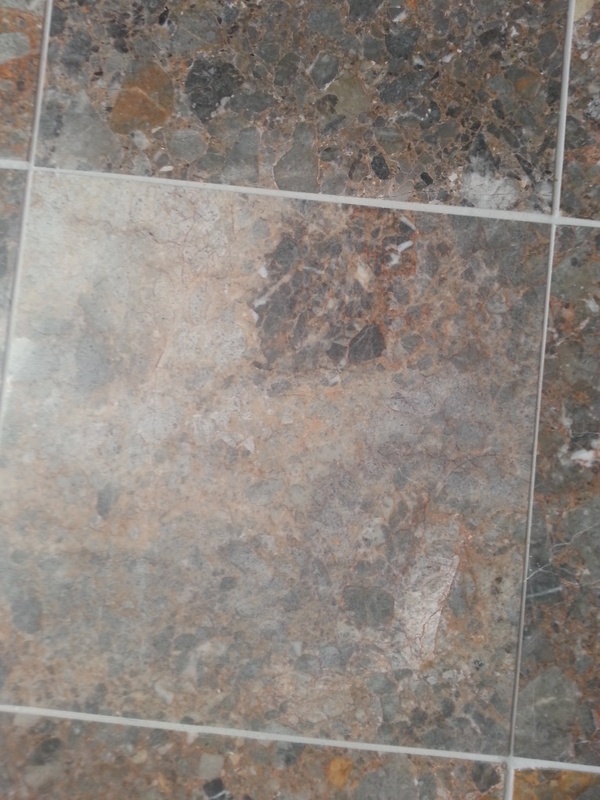 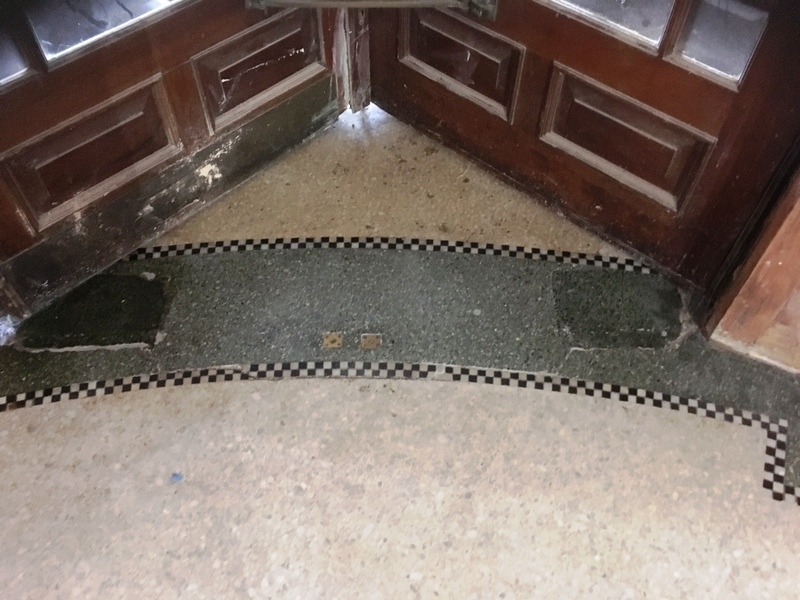 The solution was worked into the stone using a black scrubbing pad fitted to a rotary floor scrubbing machine. 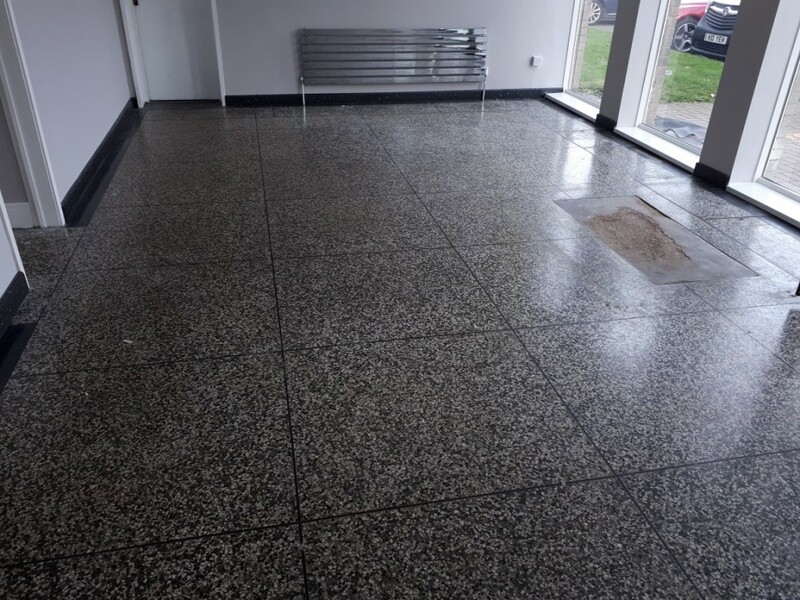 After completing the clean I rinsed the floor and removed the resulting soil with a wet vacuum, I then left the property to allow the floor plenty of time to dry before being sealed. 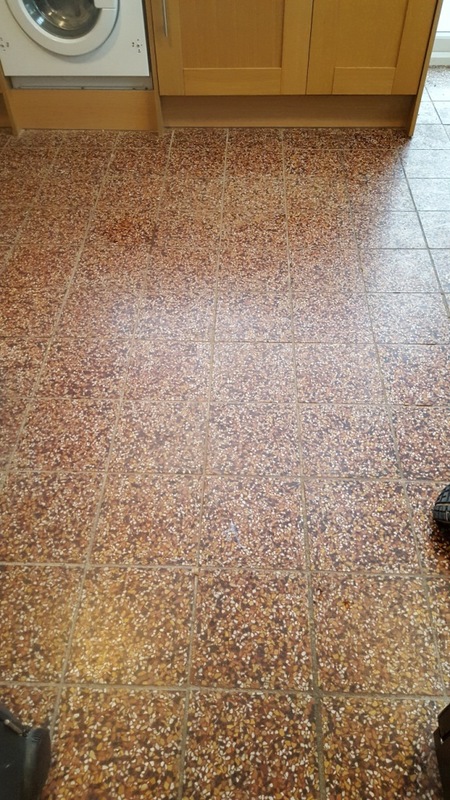 I returned the next day to seal the floor using Tile Doctor Shine Powder. 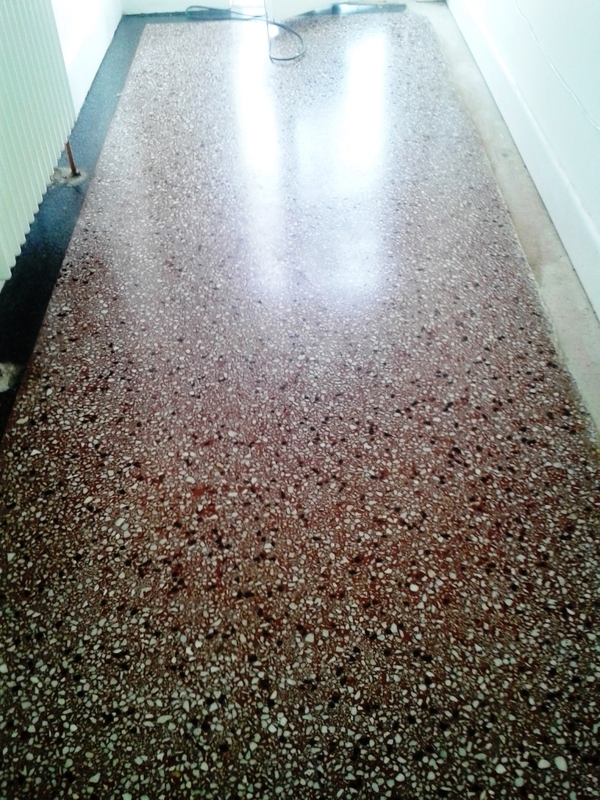 The crystallised powder is applied directly to the floor and then worked in with a buffing pad. 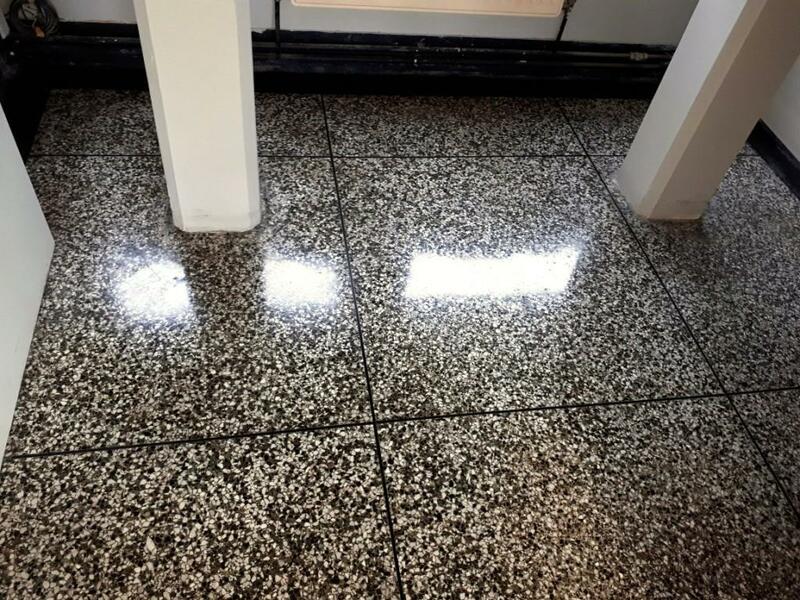 The result is a nice durable shine which had previously become dull over time due to high usage and the breakdown of an old surface seal. 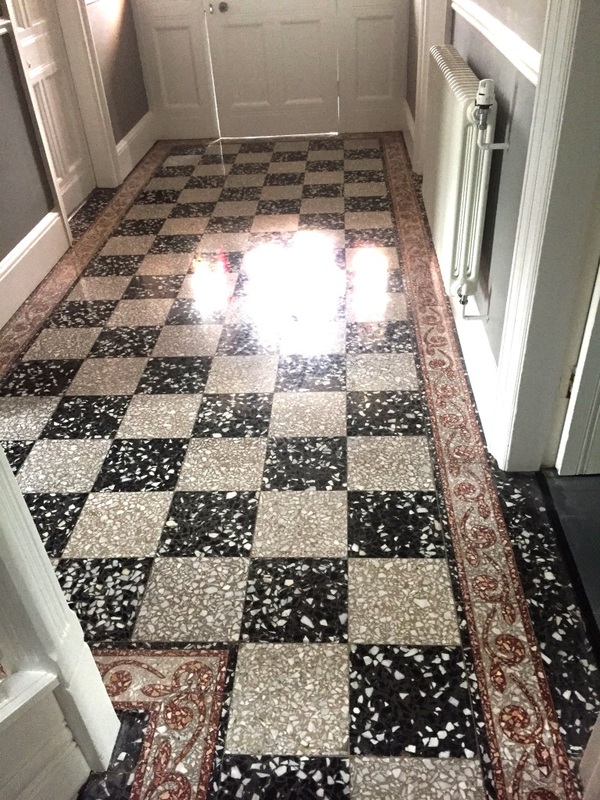 I previously restored an Quarry Tiled floor for the owner of this residence near Caerphilly Castle and was asked back to deep clean their Terrazzo hallway floor which was far from looking its best. 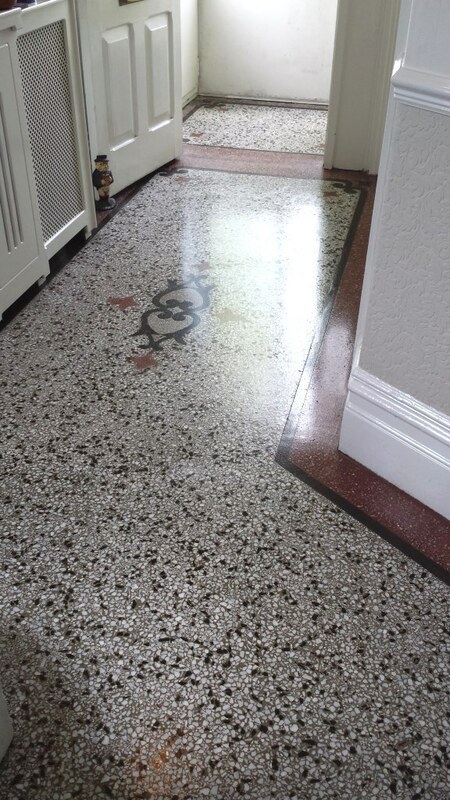 Terrazzo is a very hard surface and needs to be burnished to get the best results so after scrubbing the floor with Tile Doctor Pro-Clean and a black scrubbing pad to remove what felt like 100 plus years of black dirt I set about burnishing the floor with a set of diamond encrusted burnishing pads and a little water. 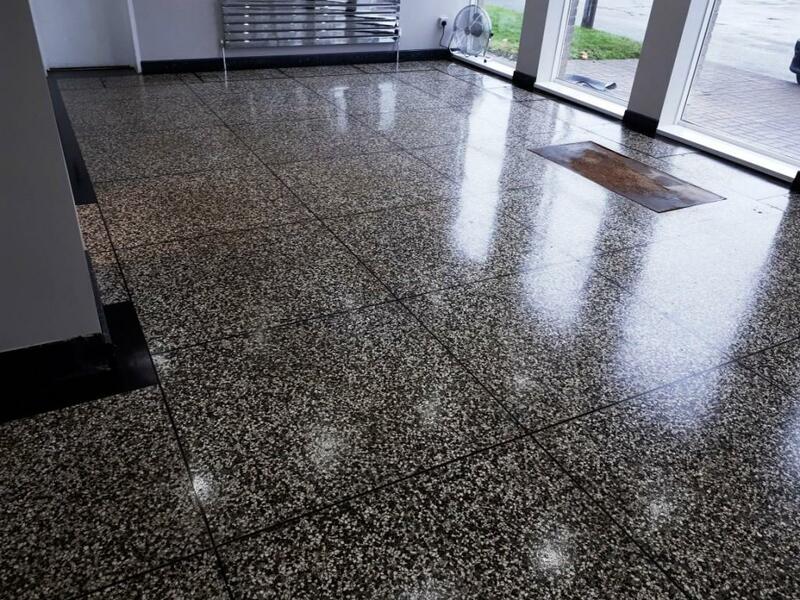 The set comprises of four different grades of diamond pads ranging from coarse to smooth that produce a shiny clean surface. 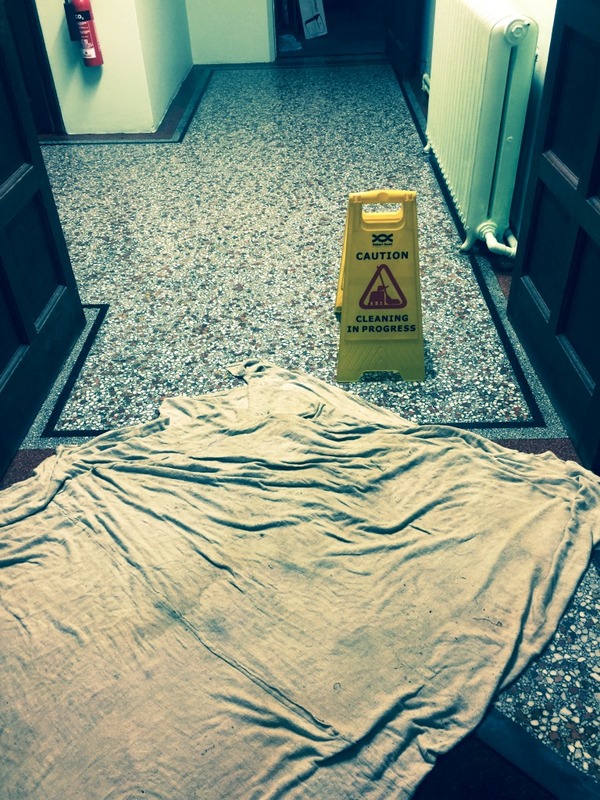 The floor is rinsed between pads to remove any slurry from the process and given another rinse at the end. 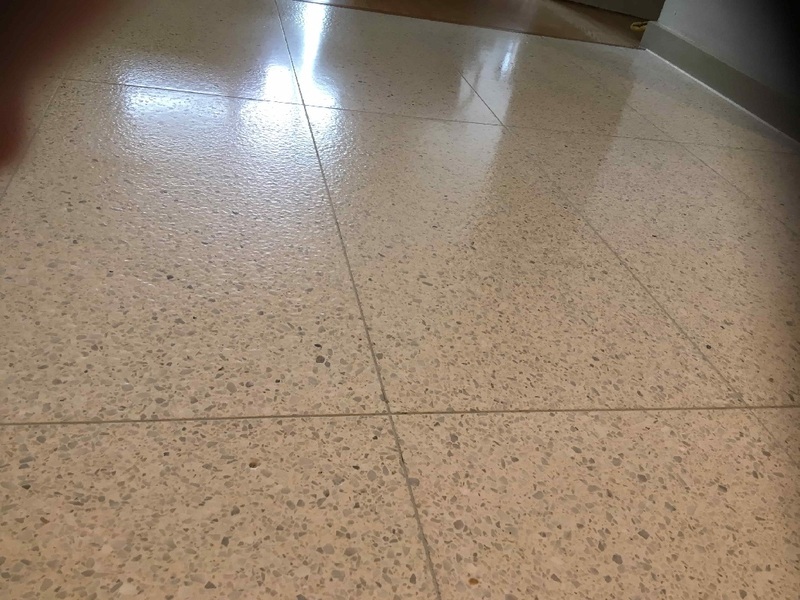 The hard Terrazzo soon dried and I was able to seal the floor with the application of three coats of Tile Doctor Colour Grow which is a colour enhancing impregnating sealer which will prevent staining and make it easier to clean in future. 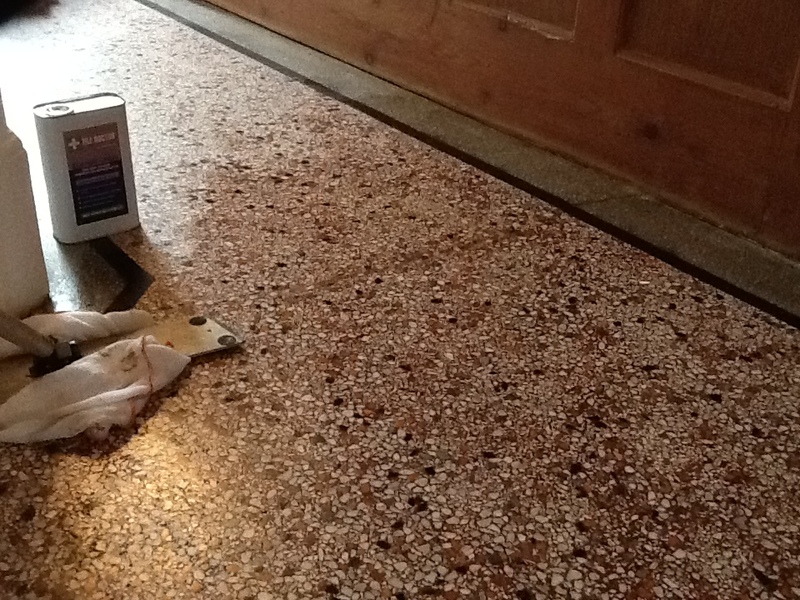 Once the last coat was dry I and gave the floor a further polish with the 4th stage green pad to give a true deep shine. 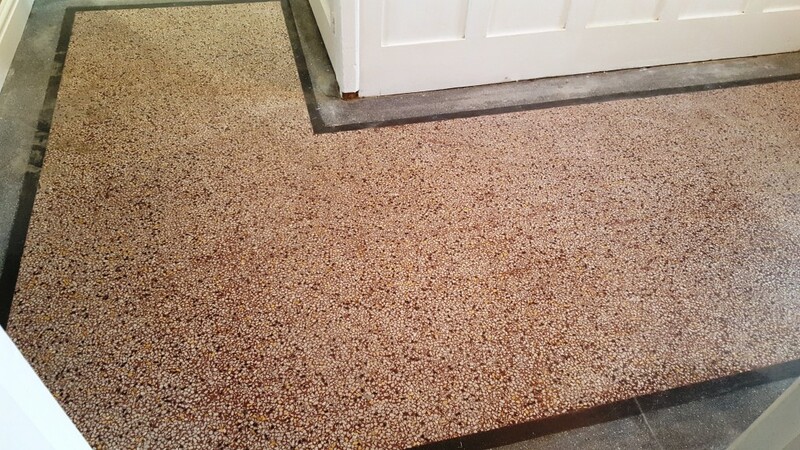 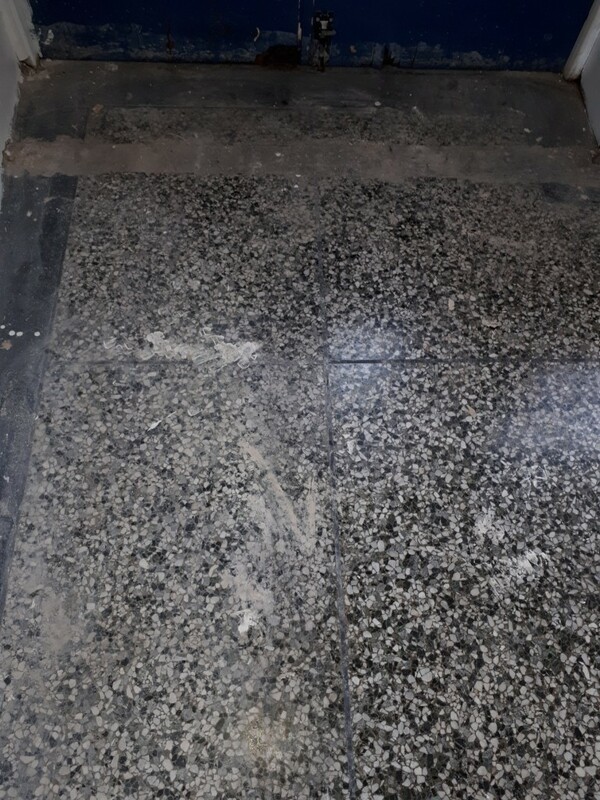 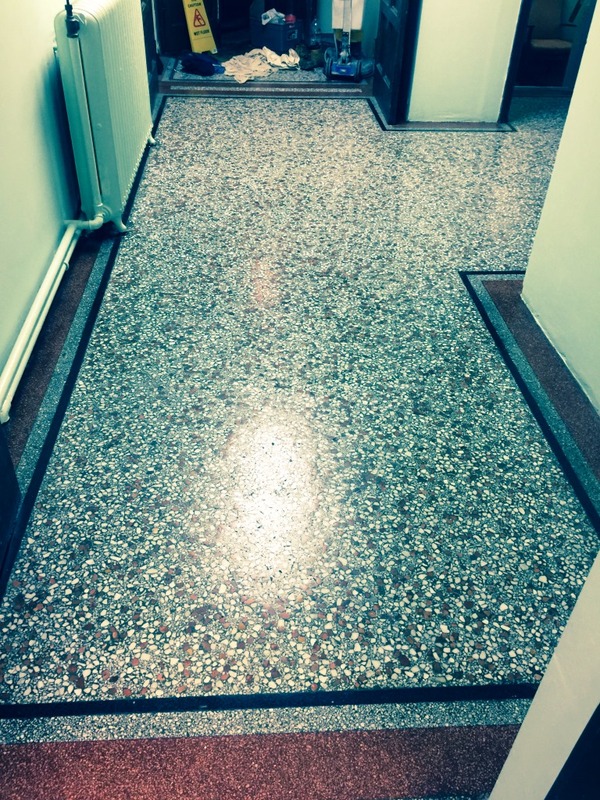 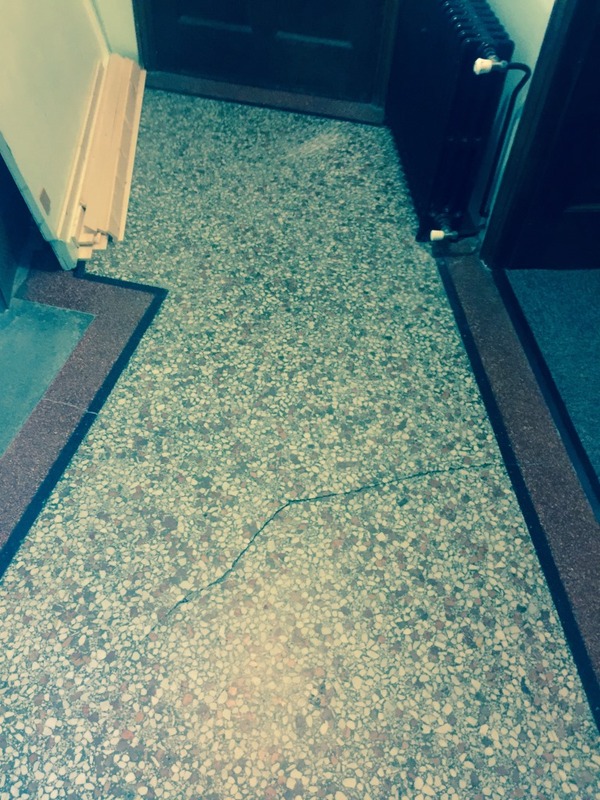 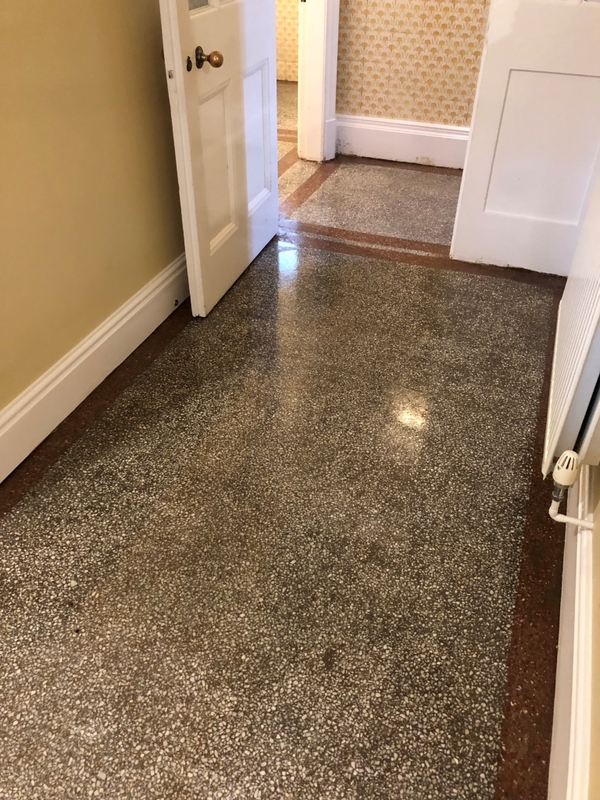 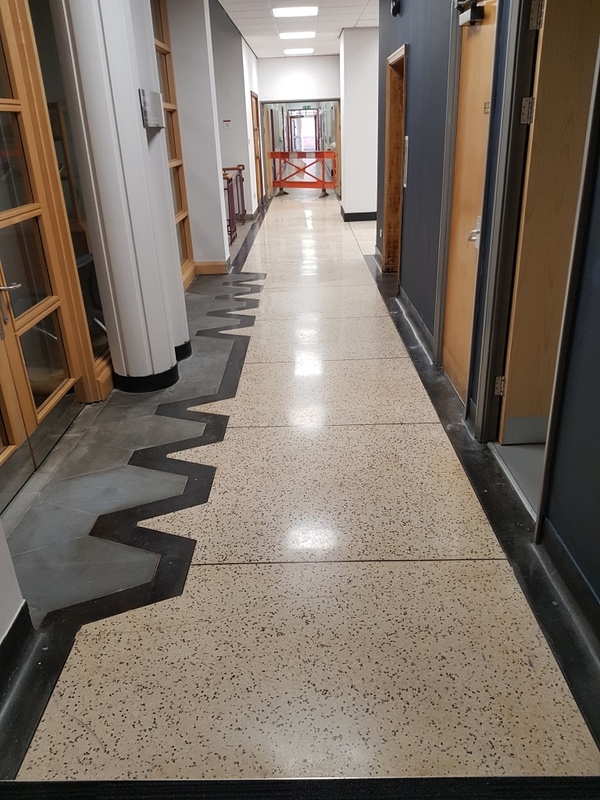 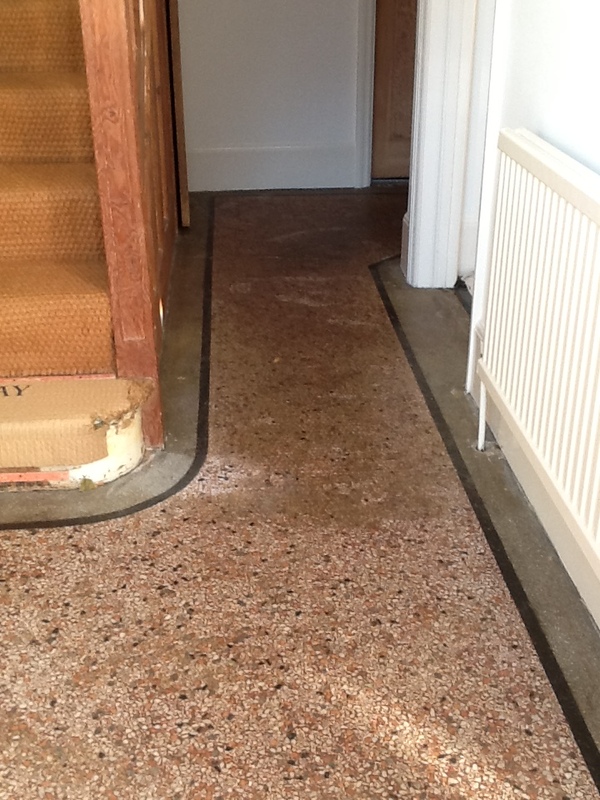 I think you will agree that what was once an old and tired terrazzo hallway floor now looks much better following its facelift, something that was only made possible due the quality of installation when first laid. 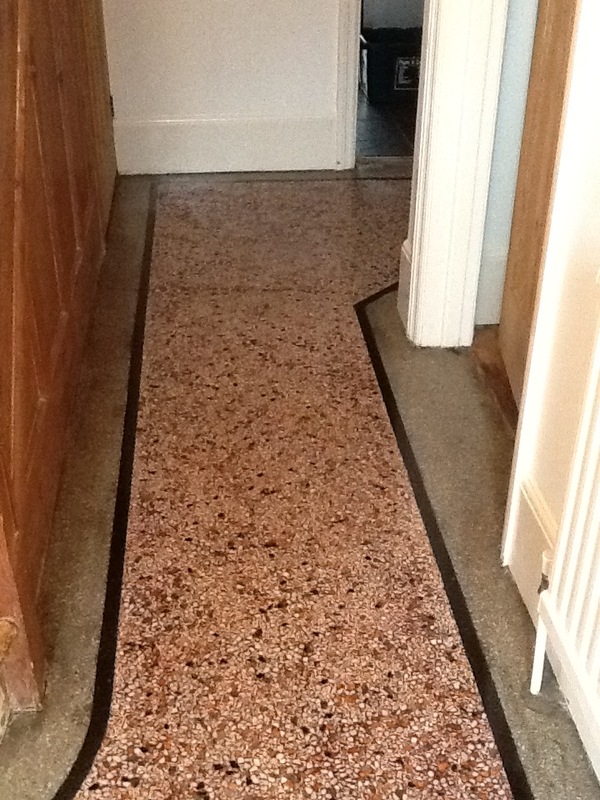 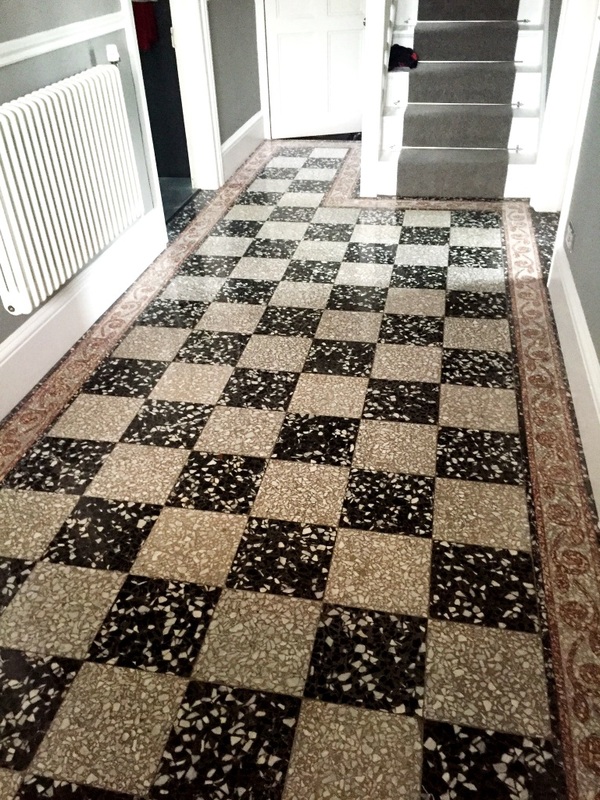 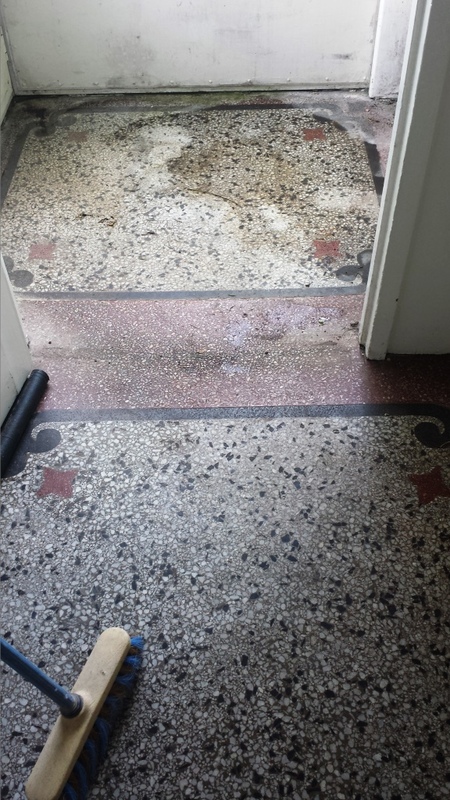 I do enjoy breathing new life into old floors as was the case with this Terrazzo tiled hallway floor in Southbourne near Bournemouth, installed in 1924 it had been knocked about by various building alterations and then finally covered in a carpet which had been glued to the floor. 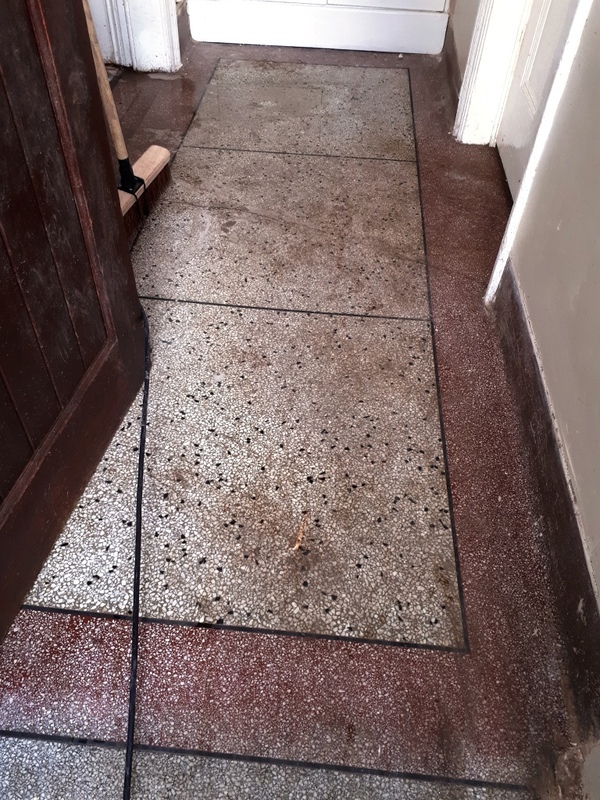 Stubborn remnants of the carpet adhesive were removed using Tile Doctor NanoTech HBU Remover which is applied to the tiles and then left to soak in for a before being scrubbed in with a black buffing pad and a dilution of Tile Doctor Pro-Clean. 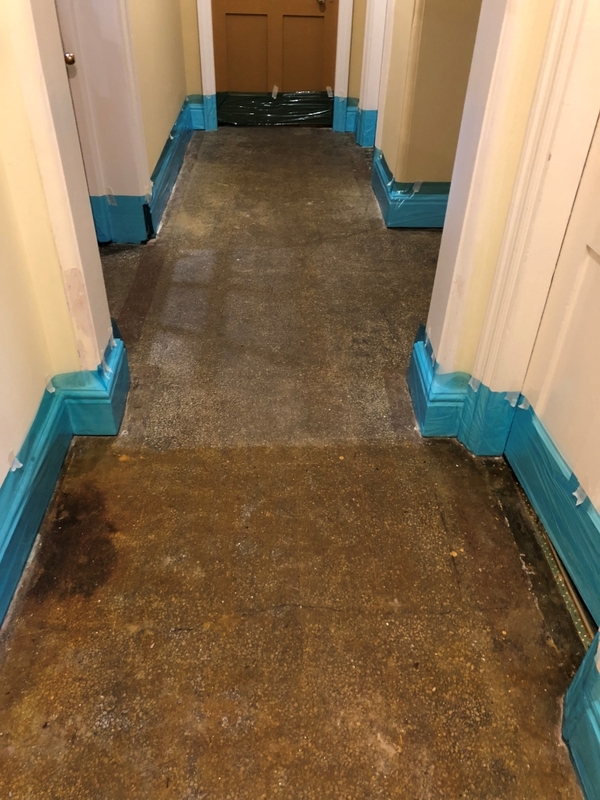 HBU actually stands for Heavy Buid-up Remover and it’s a great problem solver that penetrates through tough stains and coatings so they can be easily removed. 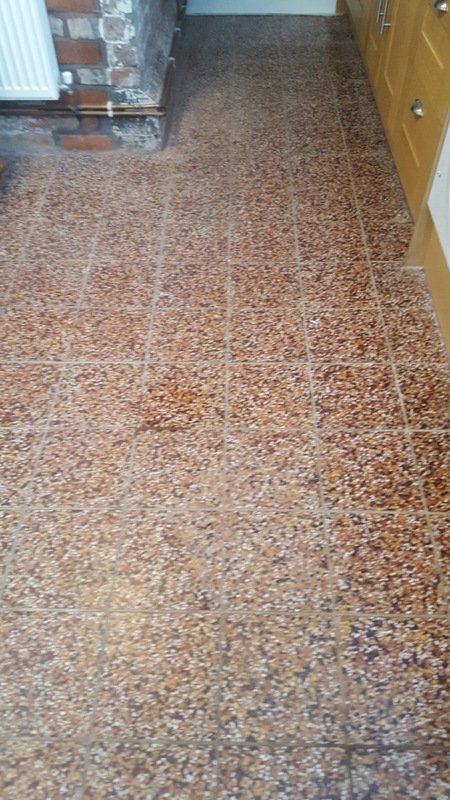 The floor was then washed down with clean water and any areas that needed further attention were retreated until I was satisfied with the floor was clean and free of glue. 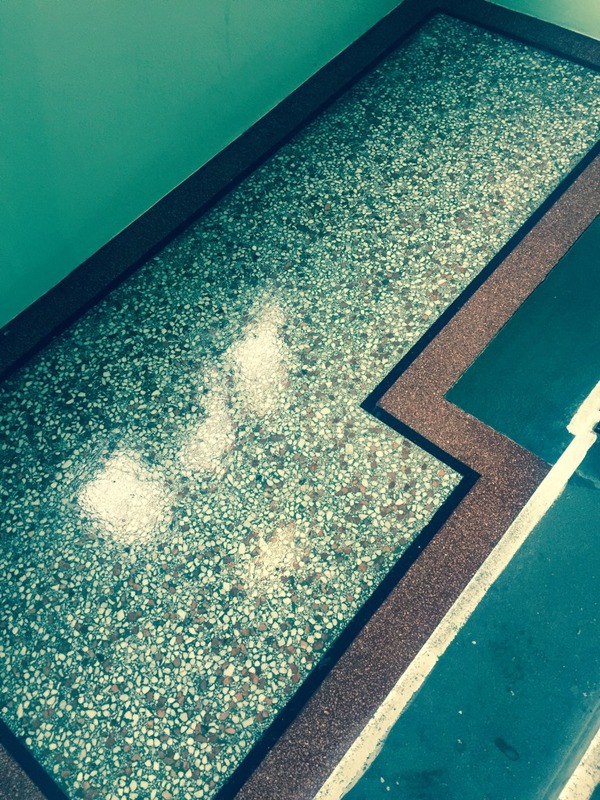 The next step was to re-polish the Terrazzo using a set of of Tile Doctor burnishing pads which are applied in sequence from Coarse through to Super Fine with a little water to help lubricate. 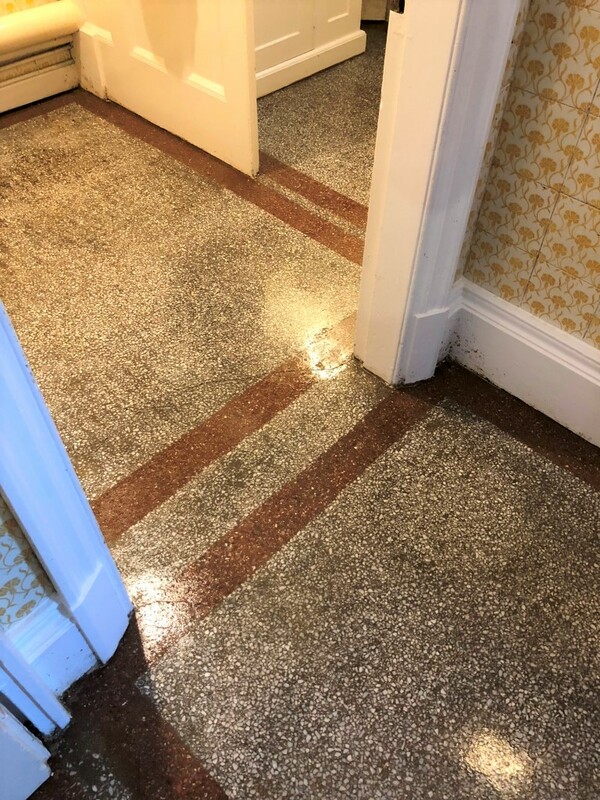 The coarse pad removes any surface grime and old sealant and the remaining pads build up the polish to bring back the original shine. 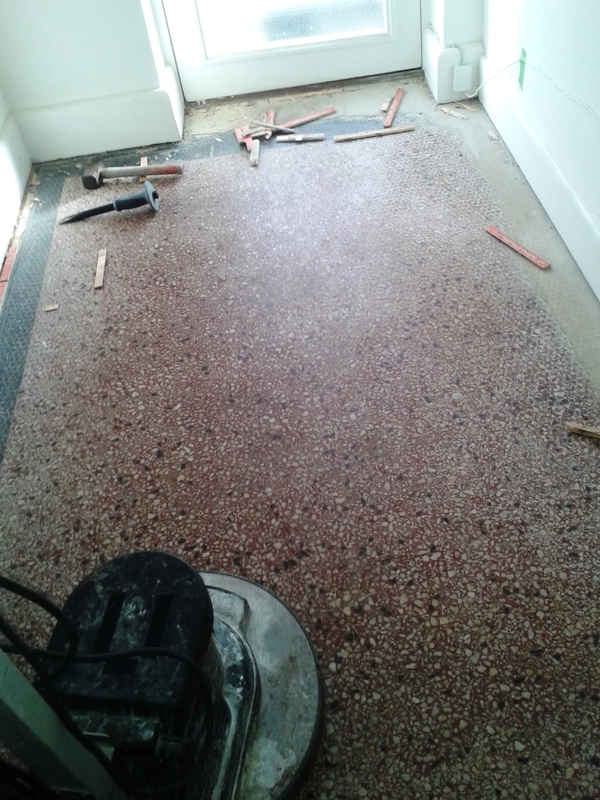 The floor is washed down between each pad to remove the soil generated during the process. 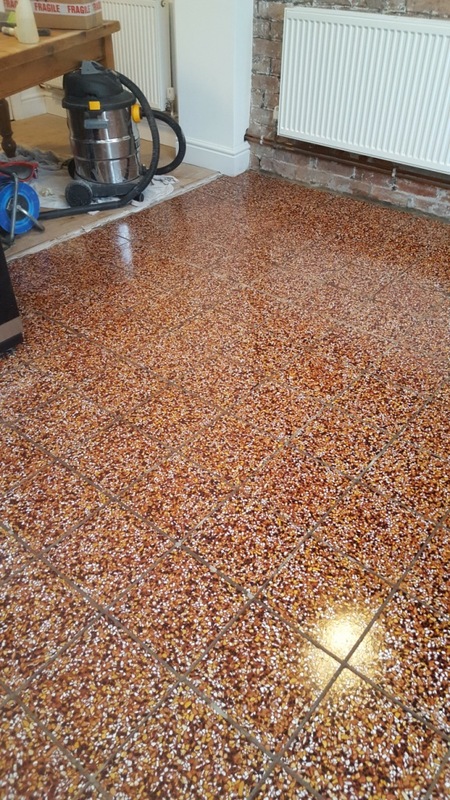 Cleaning took most of the day so I returned the next day to apply the sealer testing the floor first to ensure it was dry. 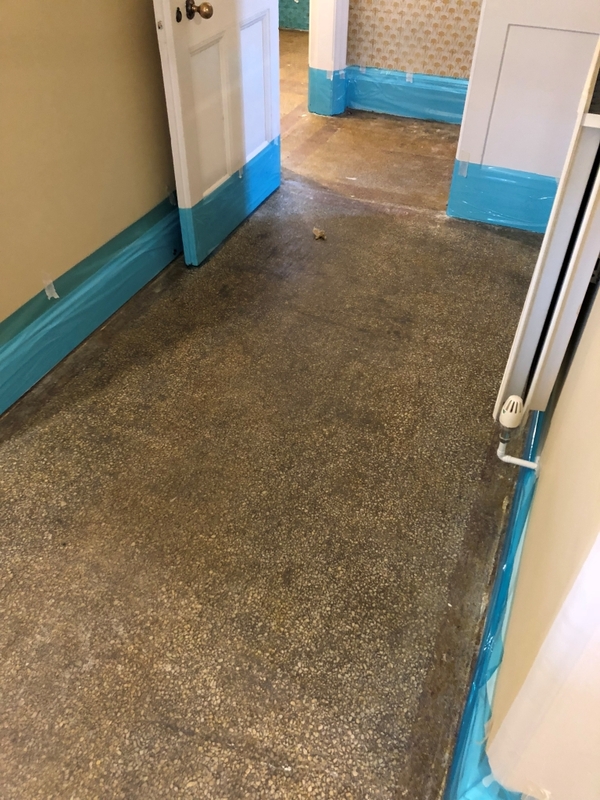 To seal the floor I used a couple of coats of Tile Doctor Colour Grow which is a colour enhancing sealer that impregnates into the pores of the stone and prevents contaminates staining the floor. 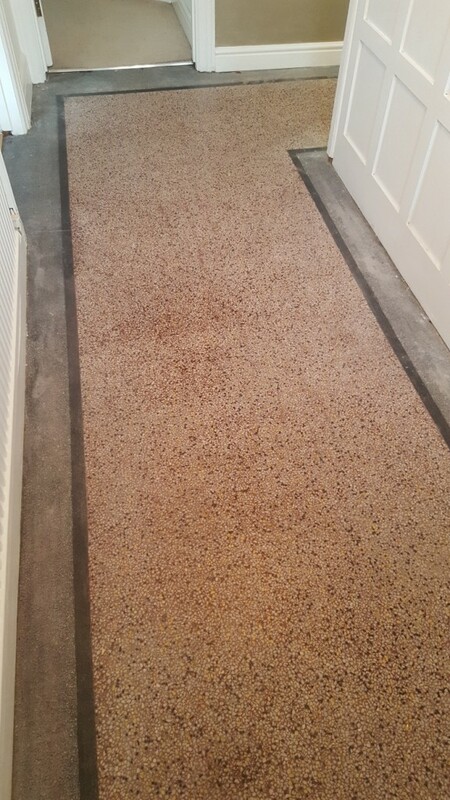 The customer decided that she would conceal the concrete patches at the edges of the floor using Colours Stone Effect speckled spray paint which is available in B&Q in her own time. 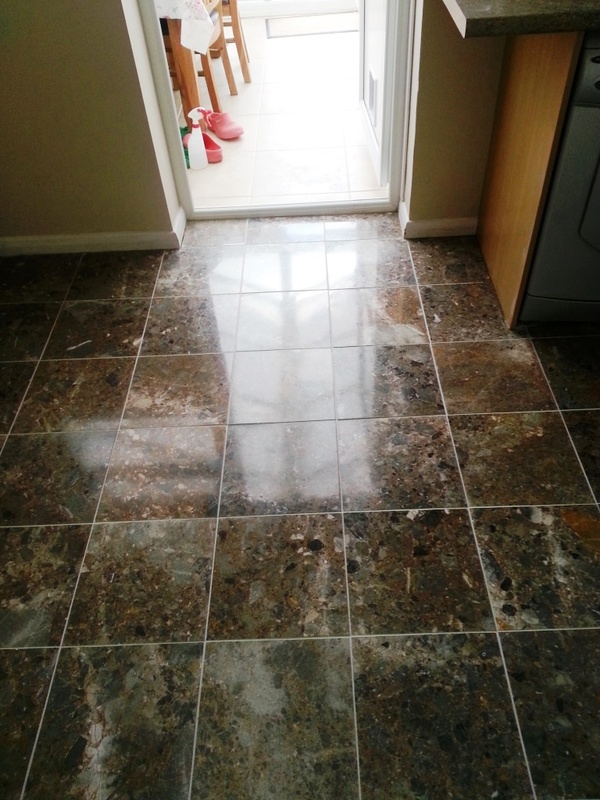 As you can see from the photos the floor looked a hundred times better and the customer was very satisfied with the result. 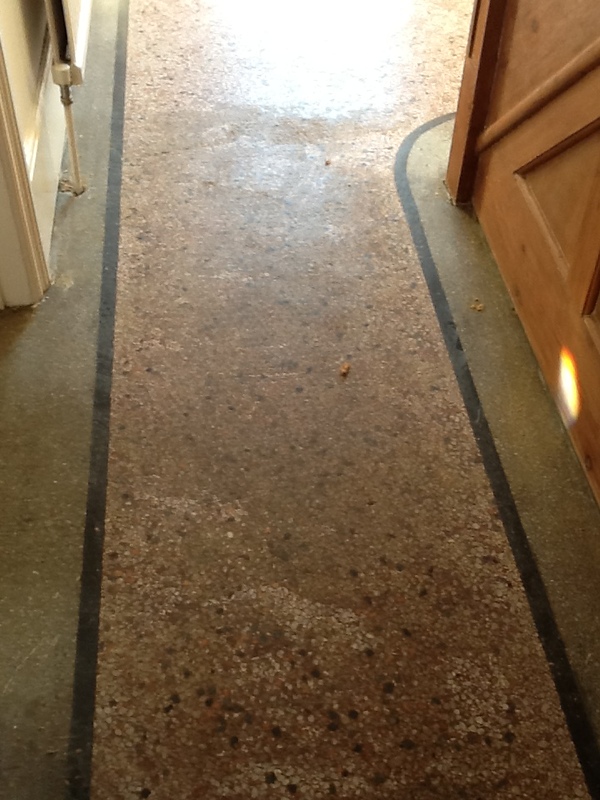 These photographs are taken from an old Terrazzo floor in the kitchen of a house in the busy market town of Oakham, Rutland. 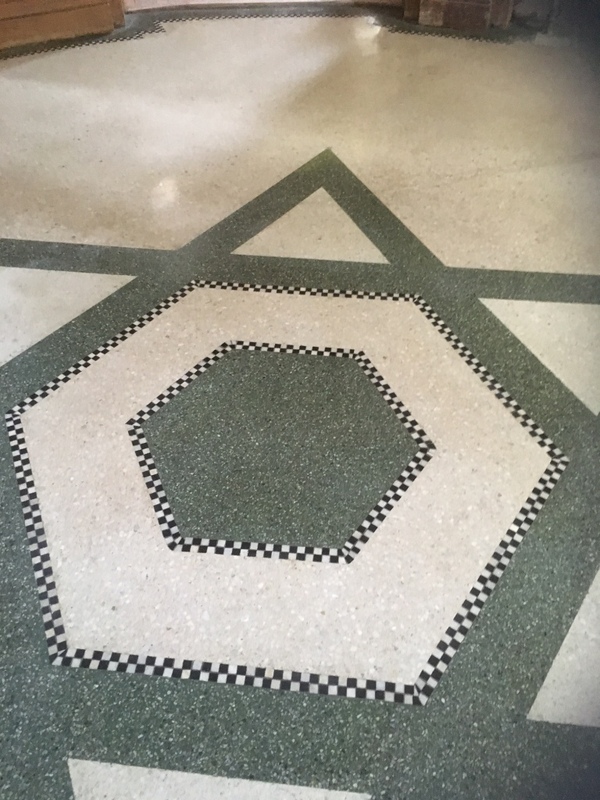 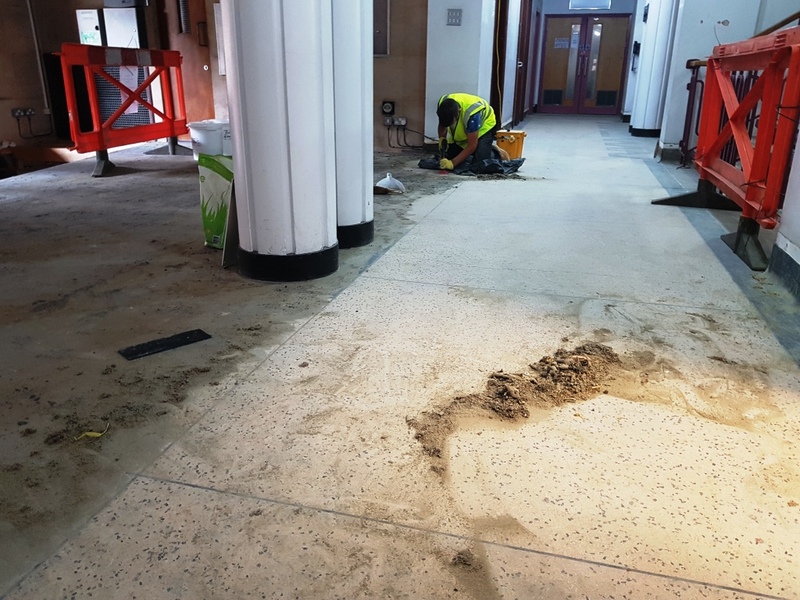 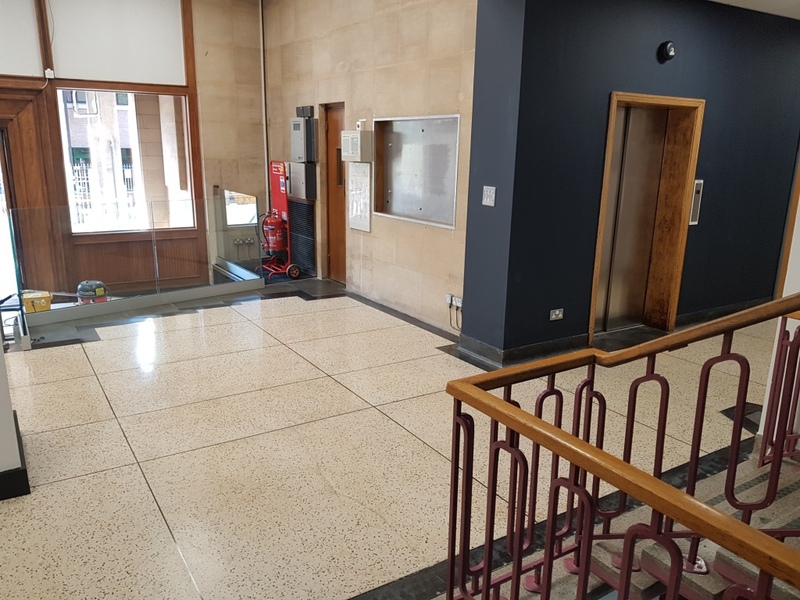 The floor was looking rather grubby and now overdue a deep clean to remove dirt and grease from the floor and being a hard polished stone it would also need to be burnished to restore the appearance of the Terrazzo. 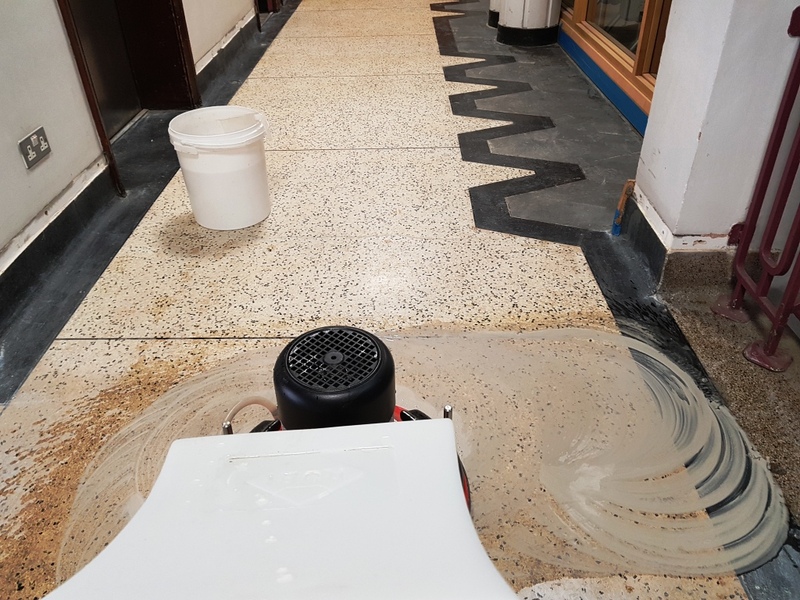 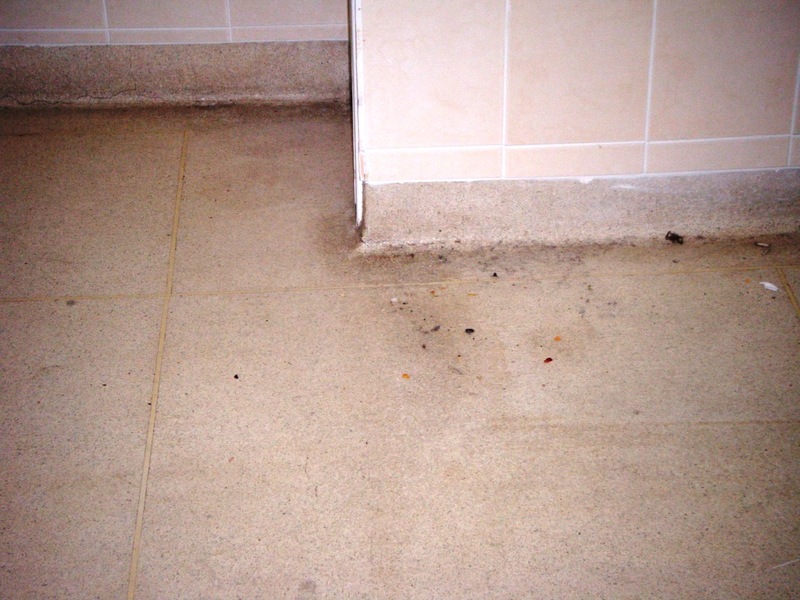 To resolve we deep cleaned the floor by applying a strong dilution of Tile Doctor Pro-Clean which was left to soak in for a good fifteen minutes before being worked in using a rotary machine fitted with a black scrubbing pad. 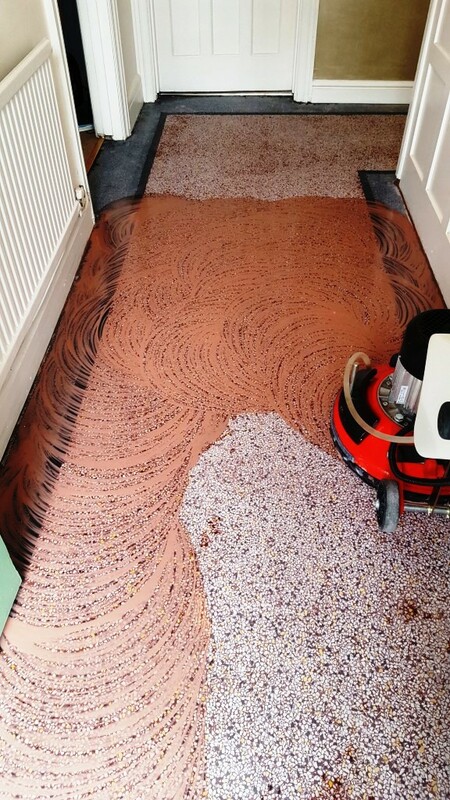 The cleaning solution soon became soiled as the dirt was lifted out of the floor and this was removed with a wet vacuum and the floor then rinsed with water. 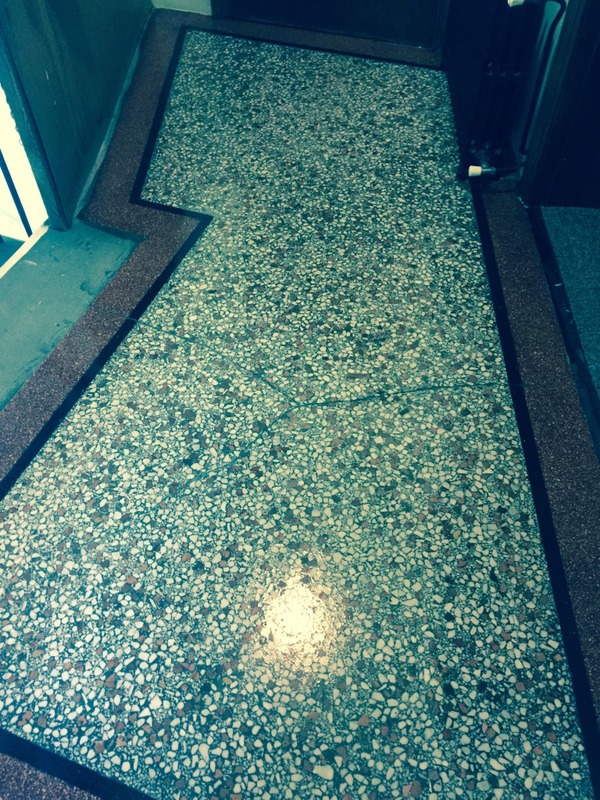 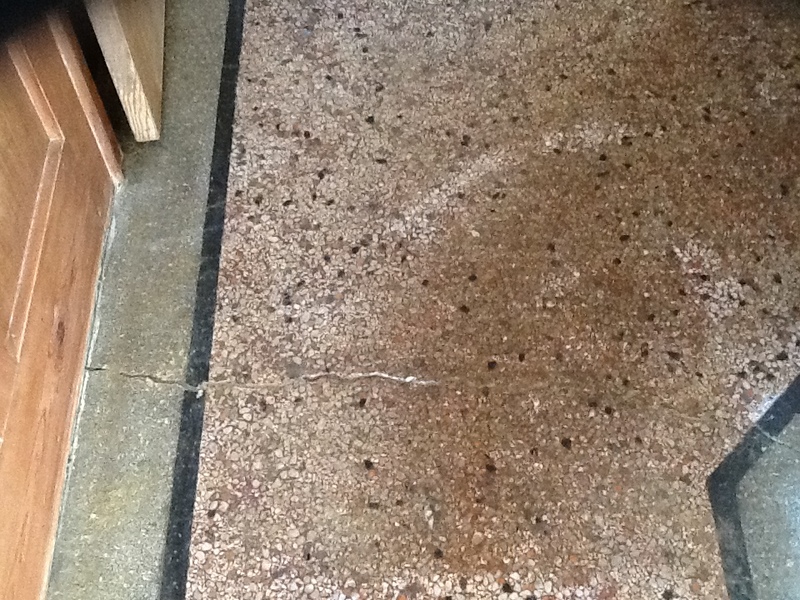 The next step was to strip back the surface of the Terrazzo so it could be polished. 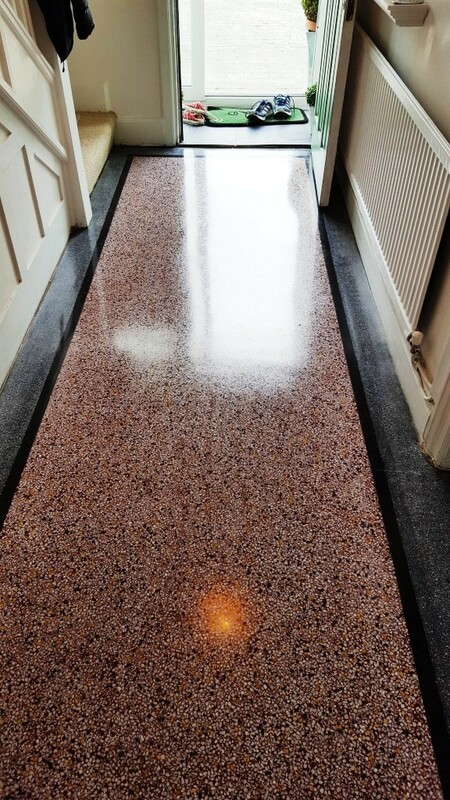 This is done using a set of diamond encrusted burnishing pads which come in a set of four grades from Coarse to Super Fine. 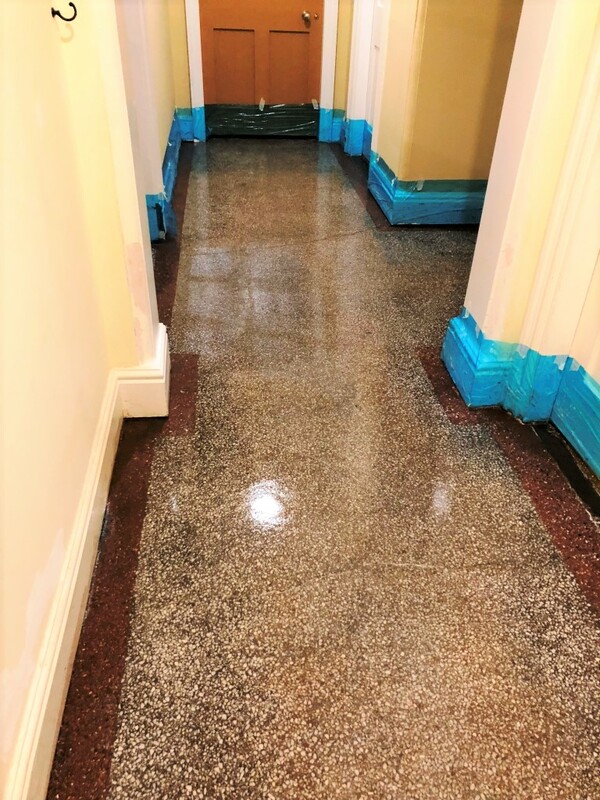 We started with the coarse pad which can remove dirt, sealers and other coatings before moving onto the medium, fine and super fine pads which polish the floor and bring up the surface. 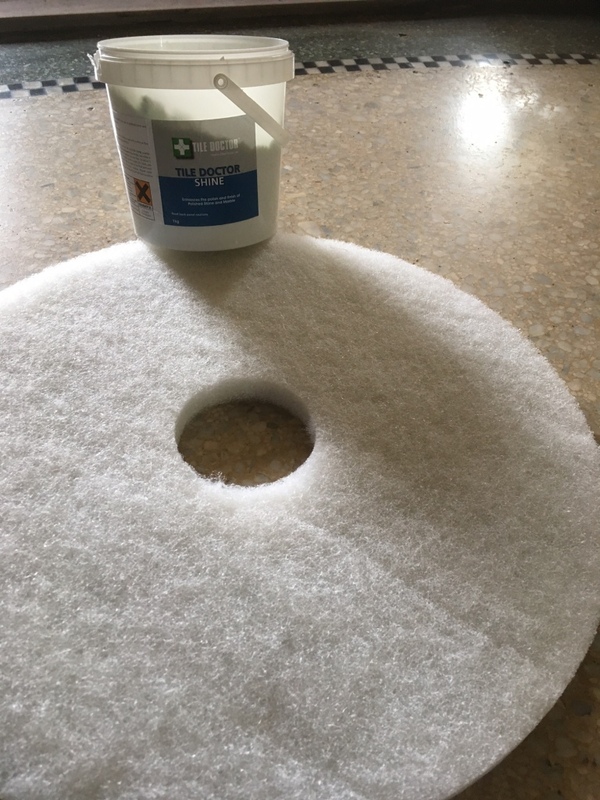 The pads use a little water which needs to be rinsed away after each pad followed by a thorough rinse at the end of the process. 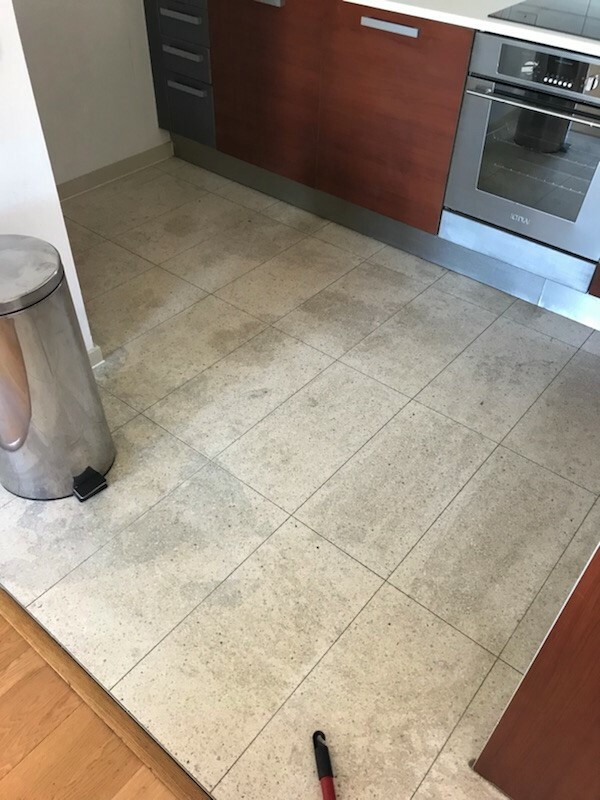 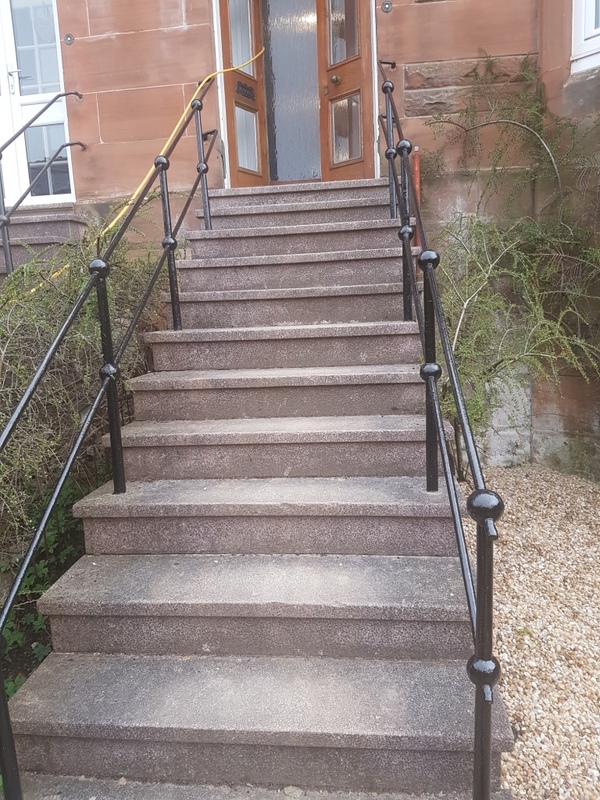 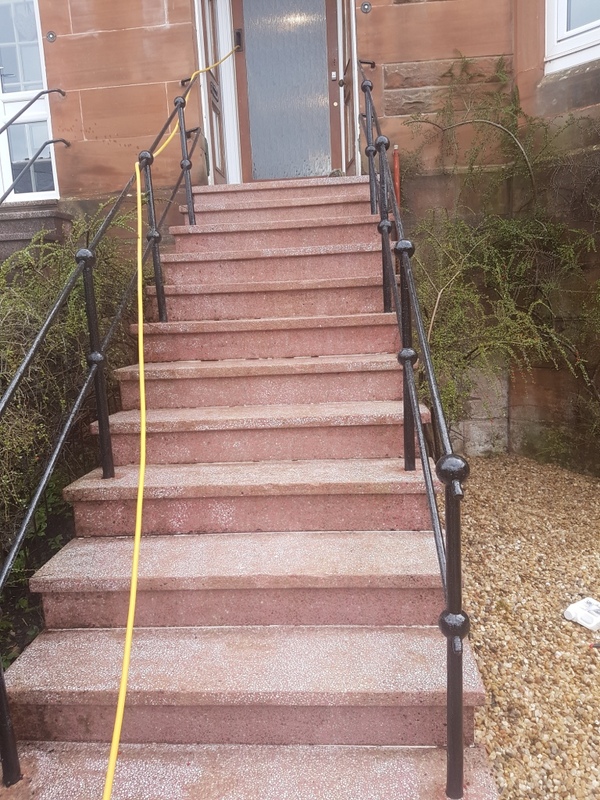 At this stage we would normally wait for the floor to dry and then seal it using a product recommended for the particular surface, location and desired appearance however on this occasion the owner was happy to leave the floor the way it was so we were able to complete the job in a single day.